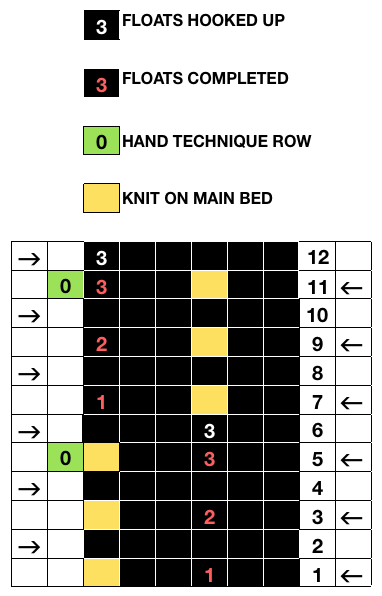 There are single rows knitting on both beds, so the option of using 2 knit carriages is out of the running. 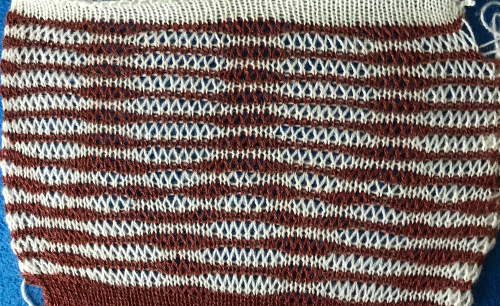 My test swatch had the main bed doing all the knitting, the ribber knitting the joining segments with manual changes in its buttons from slip to knit and back when appropriate. 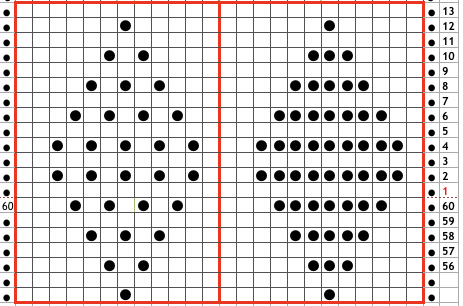 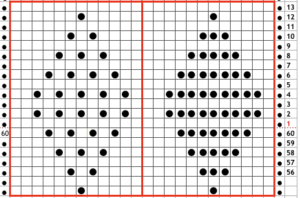 The staring needle arrangement, on “graph paper”, and the subsequent racking positions: the top illustration is for racking position 4, the bottom for racking position 0. 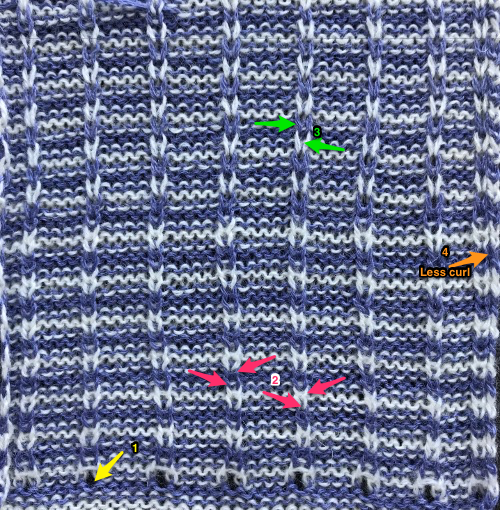 A tentative plan of attack: the combined knit and ribber carriages are to be used throughout. 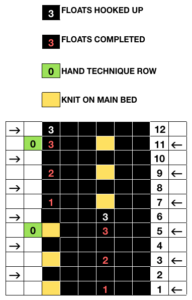 The main bed KC is set to knit, but change knob is set to KCII. The blank squares will actually knit thanks to the setting, the selected needles will indicate the direction in which racking is due to take place prior to knitting the next row. 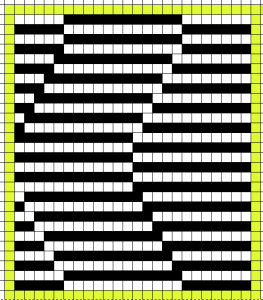 This is the starting ayab repeat, with single repeat segments highlighted (one alone would be adequate for most other electronics). Starting position can be variable. 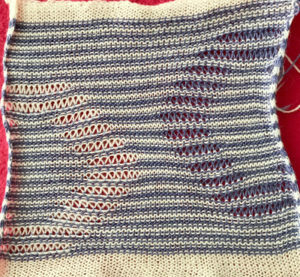 With more stitches cast on, while keeping the same ribber configuration, racking can happen further to the right or to the left. There need to be enough stitches on the main bed so ribber needles do not travel beyond them when racked. 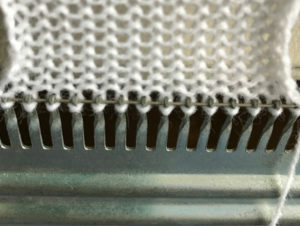 The knit bed uses tension close to that used for stocking stitch. 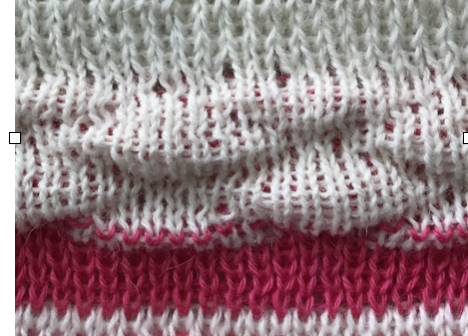 The ribber stitch size may need to be adjusted to allow for the wider move toward either side. A looser ribber tension results is a less sculptural surface on the knit side. 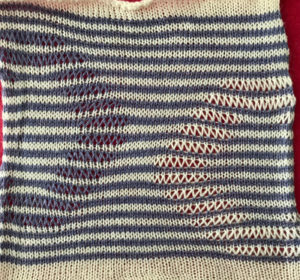 I have seldom been able to knit more than 6 rows on the main bed with ribber combination stitches on Brother, often maxing out at 4 depending on yarn. 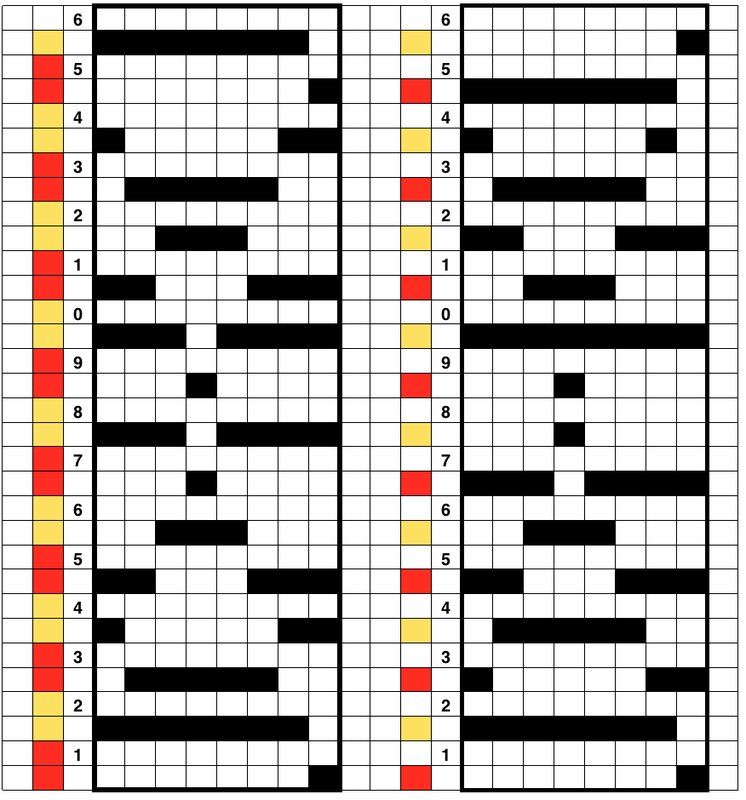 Consistent habits help develop one’s own most meaningful reminders for taking action. 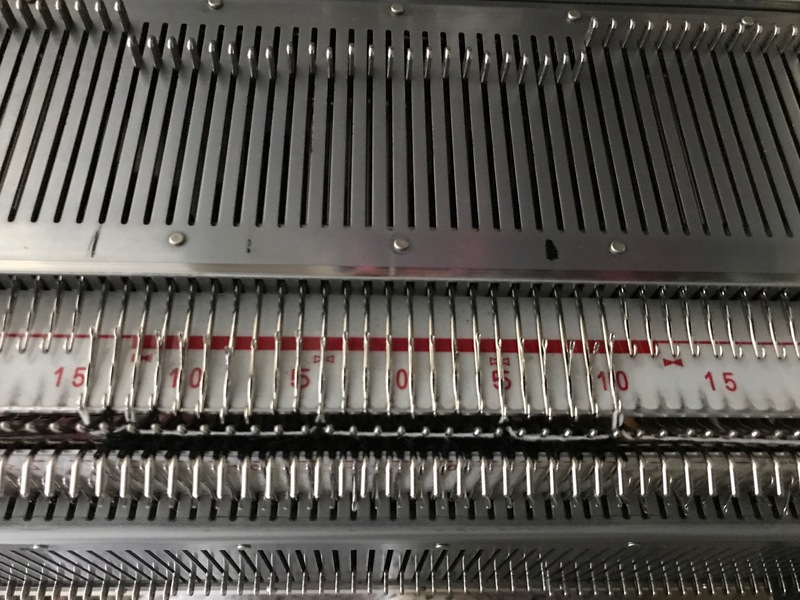 I have worked with racking in the past, but never attempted to have racked shapes interacting with single bed patterning across the width of the piece on the KM. 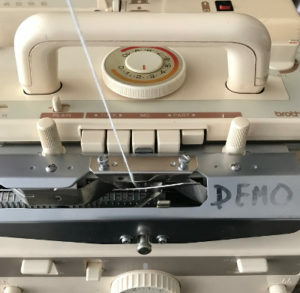 My 910 is presently connected to a Mac via the EMS Ayab kit. 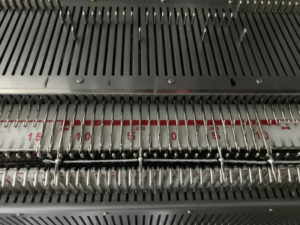 Sampling is quick and easy, replacing the mylar. 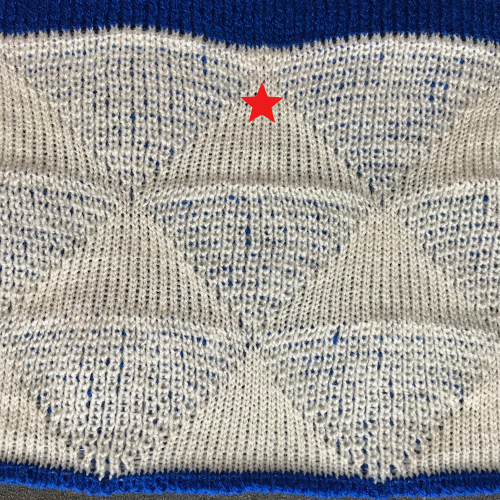 One critical difference is that the repeat used must match the pattern in width numbering the same as needles in use for the piece, so at least for testing my initial repeats were 30 stitches wide. 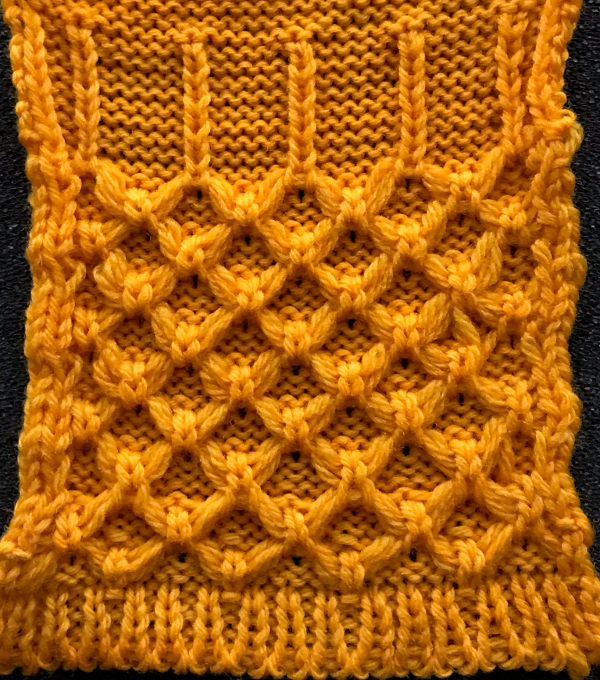 When planning for racking within the width of a piece, the racked columns will extend beyond the vertical edges of the knit. 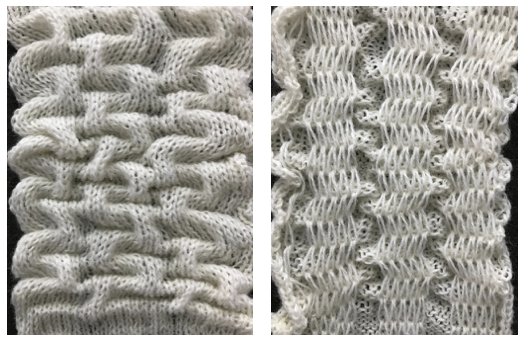 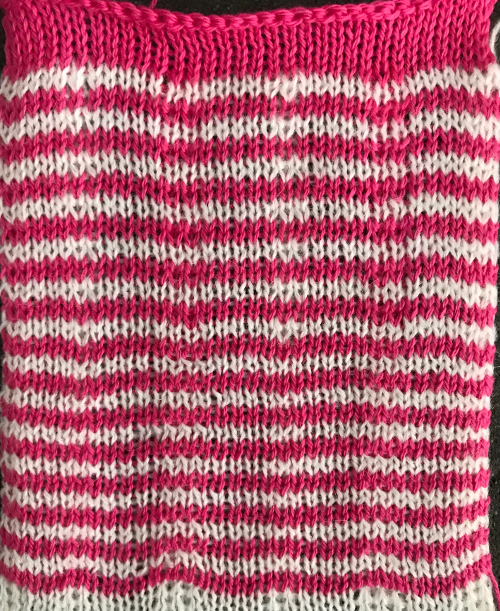 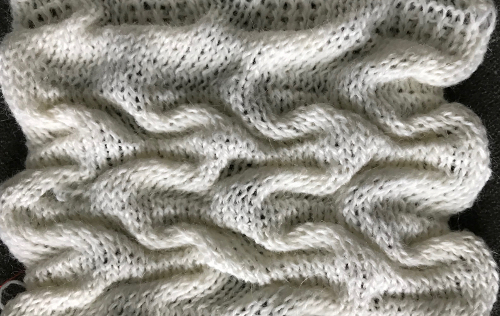 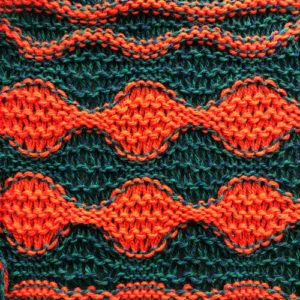 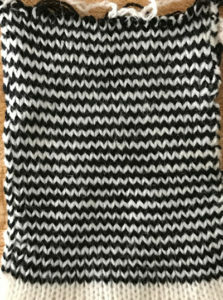 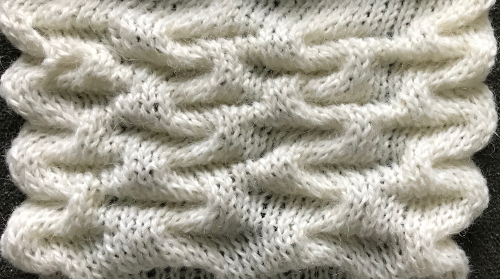 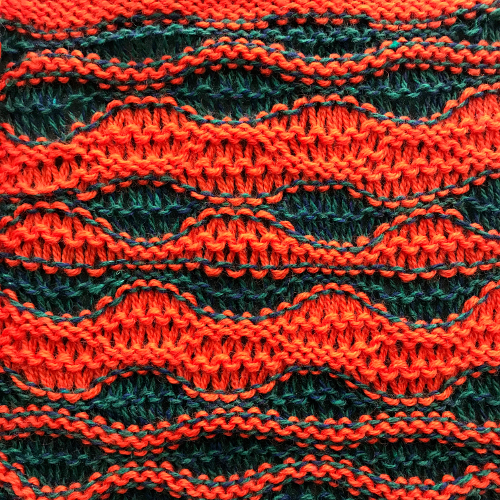 Since this is not about having zig zag edges, but keeping the design within the body of the knit, starting point and spacing for your ribbed stitches matters. 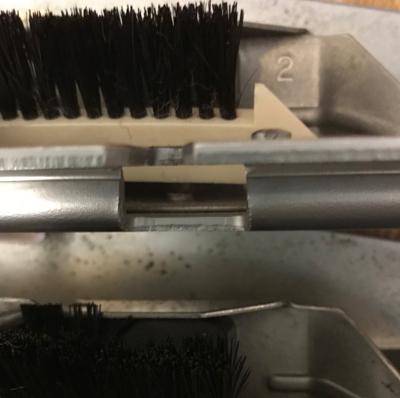 Brother racking handle is numbered from 0 to 10. 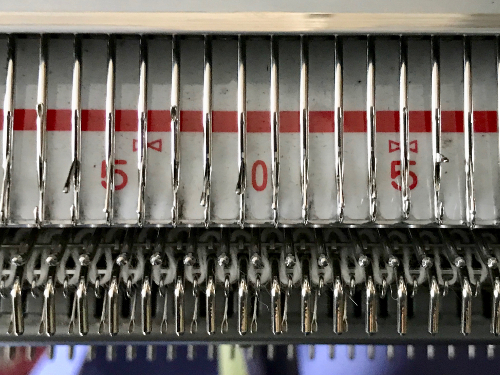 The numbering and direction of movement varies between KM brands. 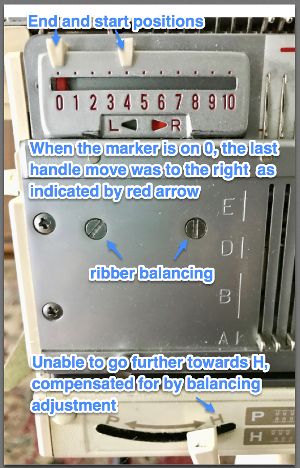 If you begin at 0, you are only allowed to move the ribber to the left, if at 10 the ribber only moves to the the right. 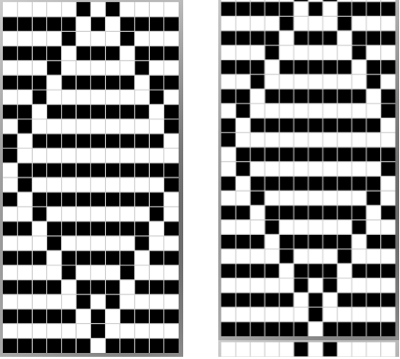 So that said, the racking sequence in the above illustration should be reversed, traveling from 10 to 0, and back. 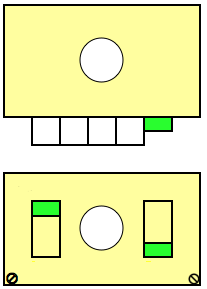 The green squares represent the direction in which the ribber stitches are moving, the numbers in the column on the right represent racking handle positions. 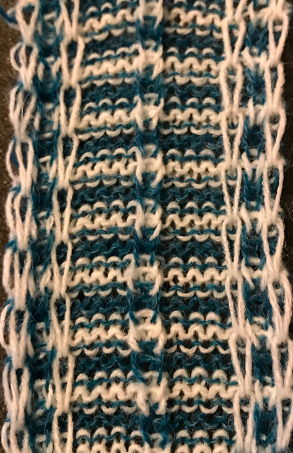 I found this slip stitch repeat produced too little detail in my swatches, but were it reduced for mylar use, it would remain 7 stitches high. 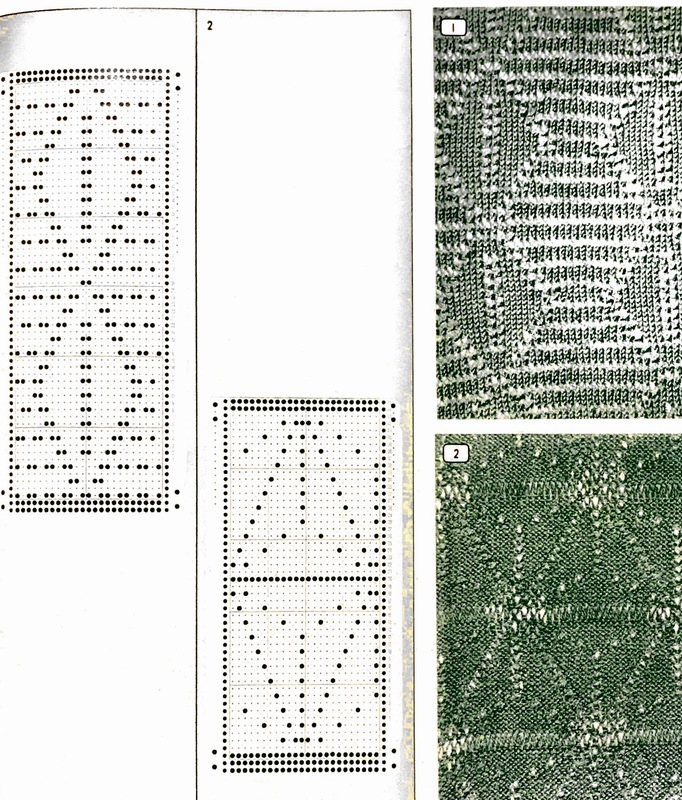 It was taken from a punchcard book, so black squares/punched holes represent knit stitches. 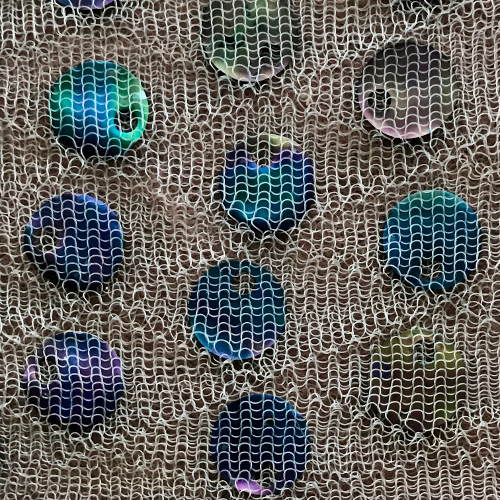 To match the fabric, in mylar use, color reverse would do the job. The Ayab kit bypasses both the mylar reader and the programming capacity of the buttons on the left, so double height, double width, color reverse, etc. 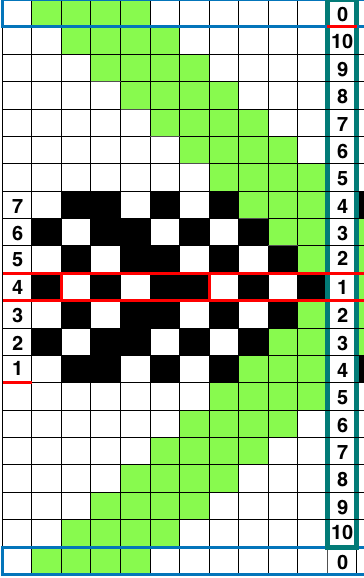 including the DBJ setting are planned for in the file import into the software. 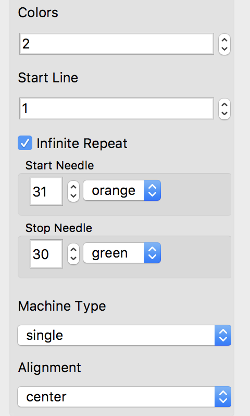 In some instances Ayab settings (ribber for DBJ, and “circular”) do the work for you. 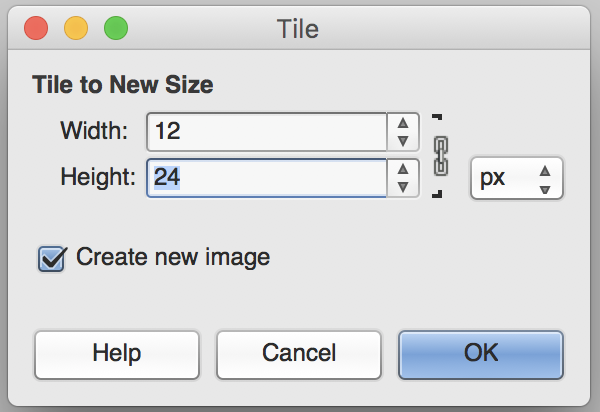 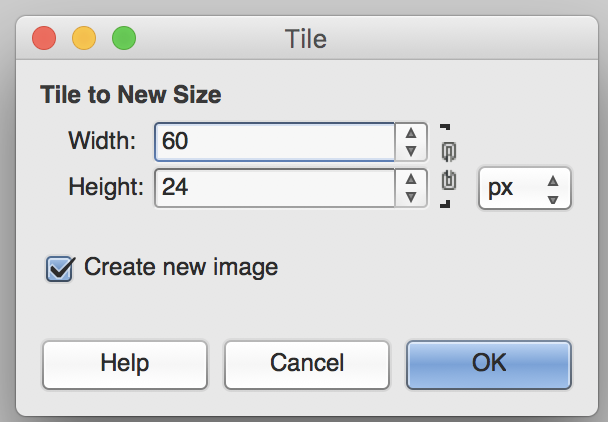 I am using GIMP to create my BMPs. 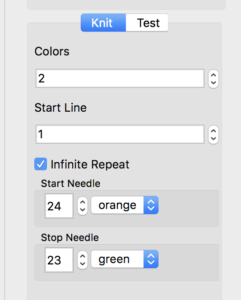 Paintbrush is a free program, still available for Mac, and functional including in High Sierra. 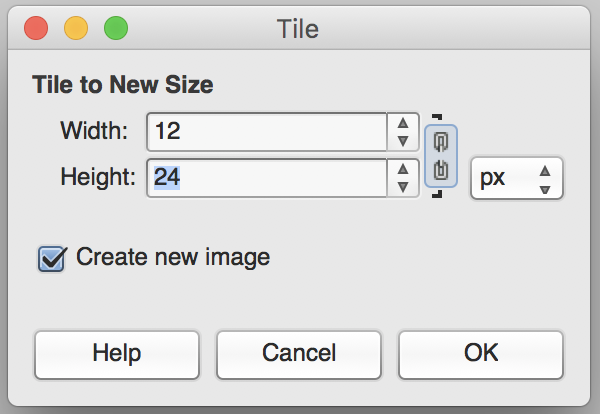 It is the program used by some forum members to create their repeats, provides an easy alternative for people who not be used to working with image editing programs. 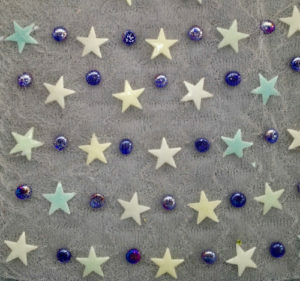 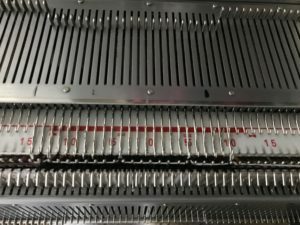 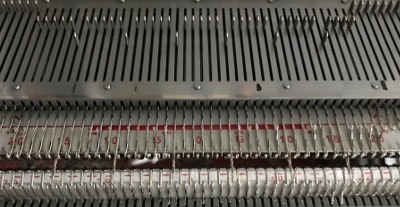 If the goal is to have the machine take care of keeping track of knit rows for you, without having to make changes in cam buttons, in the mylar a single repeat with blank squares programmed at the top and/or bottom of the repeat could then be knit using color reverse. 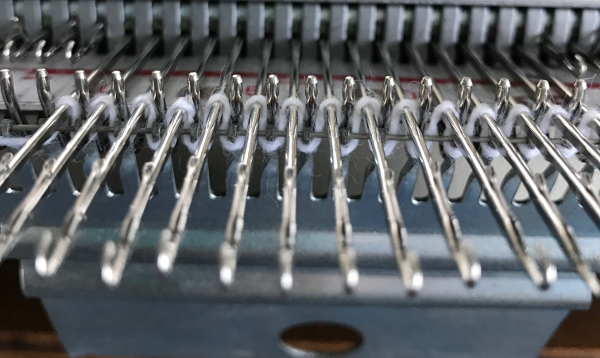 Here the situation is similar to that of punchcard users who need to punch a hole for every knit stitch, but considerably faster. 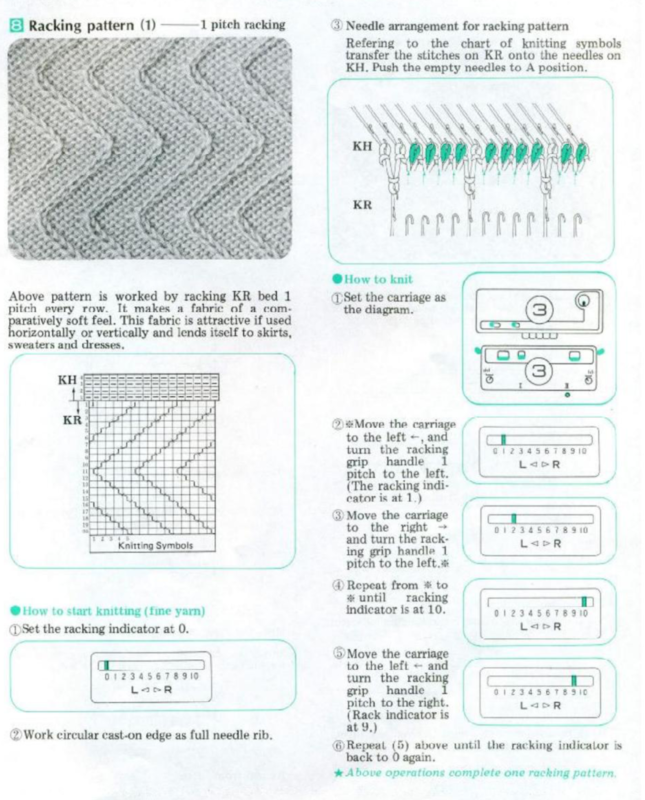 If the original pattern is satisfactory, planning for all knit rows as automatic needle selection can be done by color reversing the pattern in the software, and adding all black rows in the image for download. 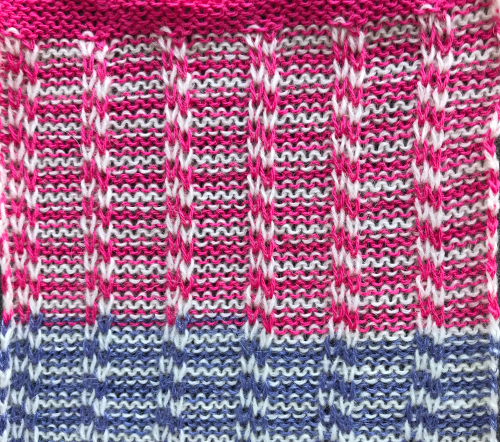 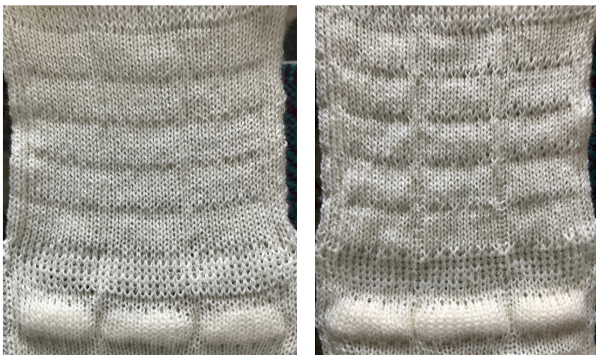 The above working repeat, and all above swatches were knit with first preselection row from right to left, not left to right. 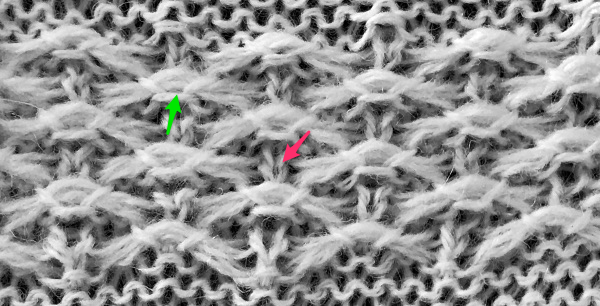 For these stitches the starting side does not make a difference. 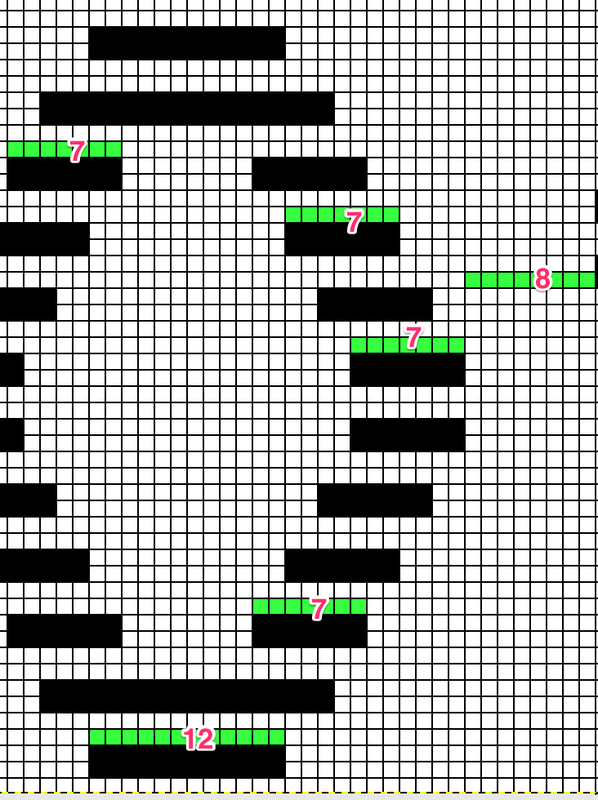 If the pattern however, was in blocks that were even numbered in height (2, 4, 6, 8), and the color changer needs to come into play for striping using it, accommodations need to made so that preselection for row 1 happens from the right side to the left, toward the changer. 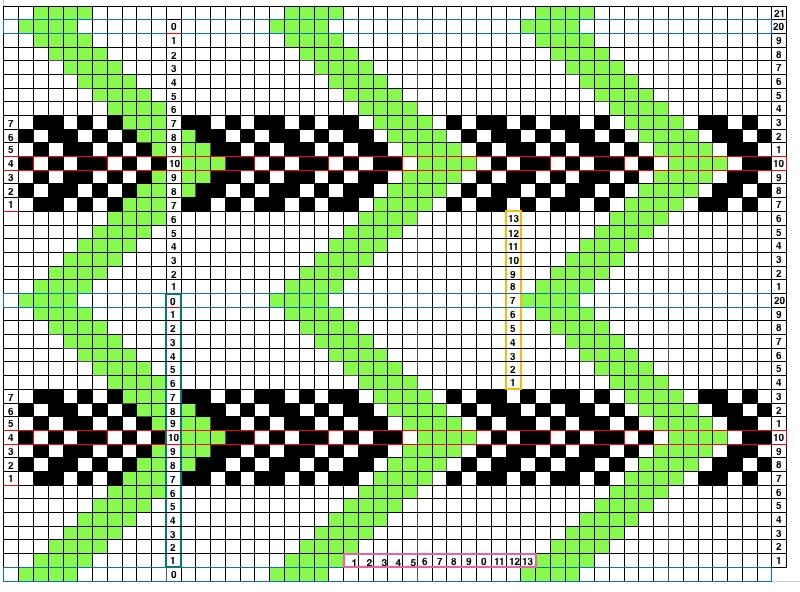 The programming needs to be set to begin on the very last row, so the repeat returns to row one for preselection from right to left, and knitting rows 1, 2, etc begin with the KC set to appropriate cam buttons, to and from the left side of the KM. 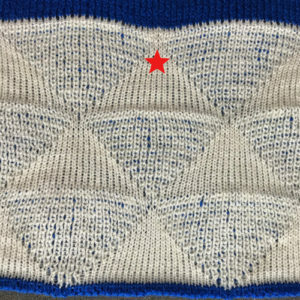 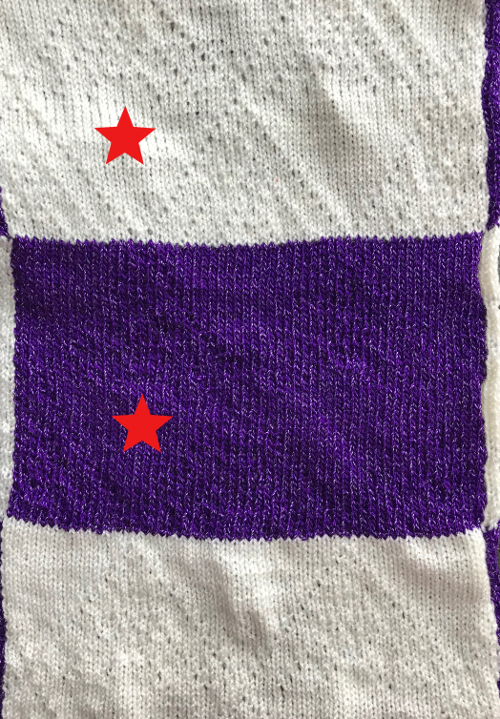 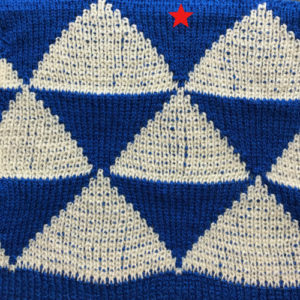 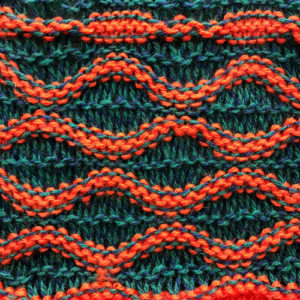 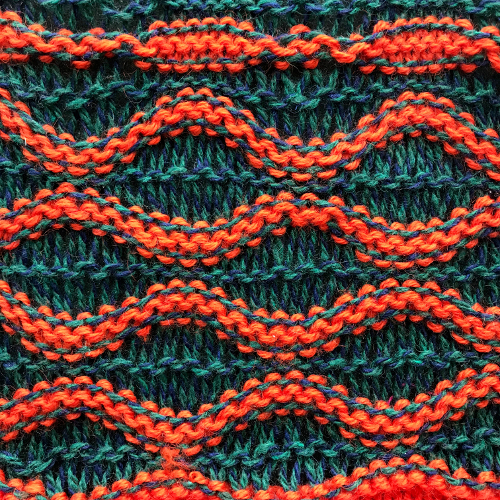 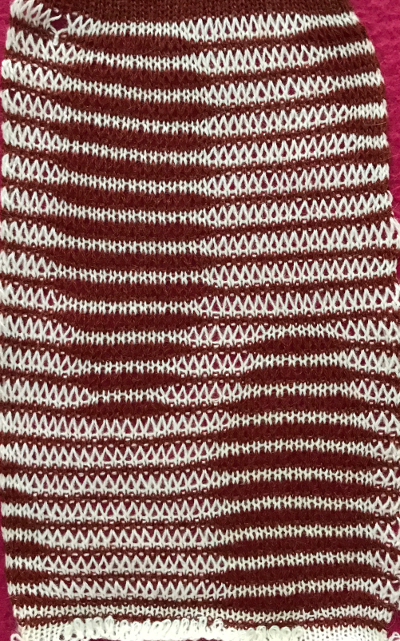 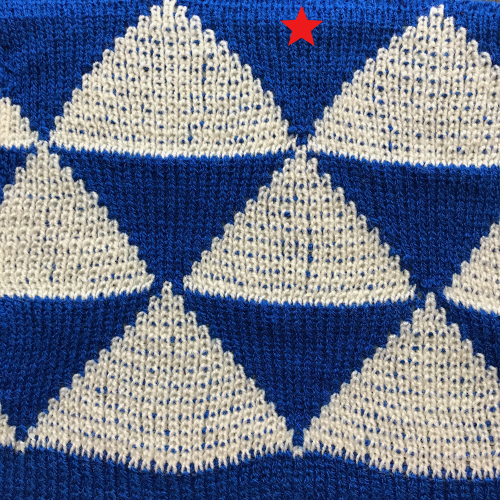 The racking sequence needs to be adjusted to have the points of the zig zag land in the center of both the slip stitch areas and those in plain knit, if that is the goal. 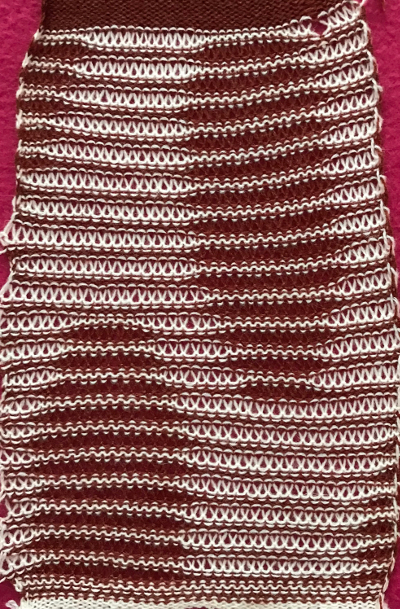 I am encountering needle selection issues with my hack, so this fabric is getting put to bed for the moment. 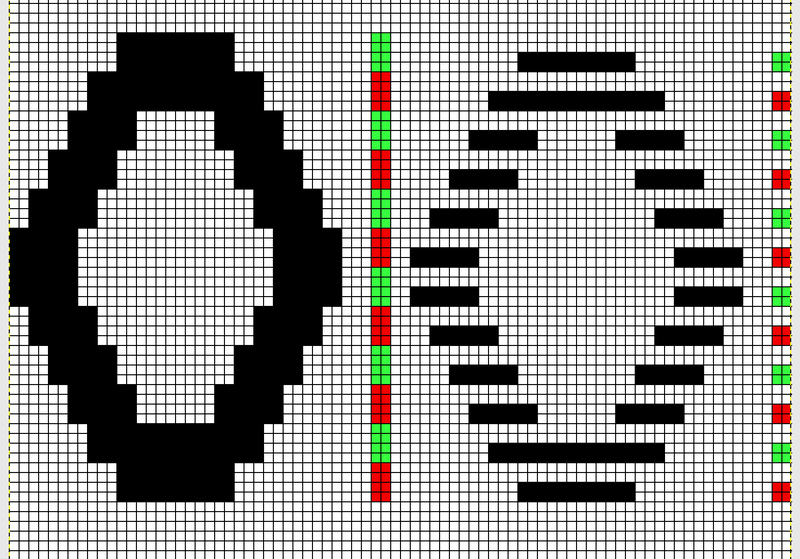 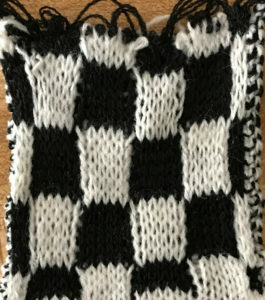 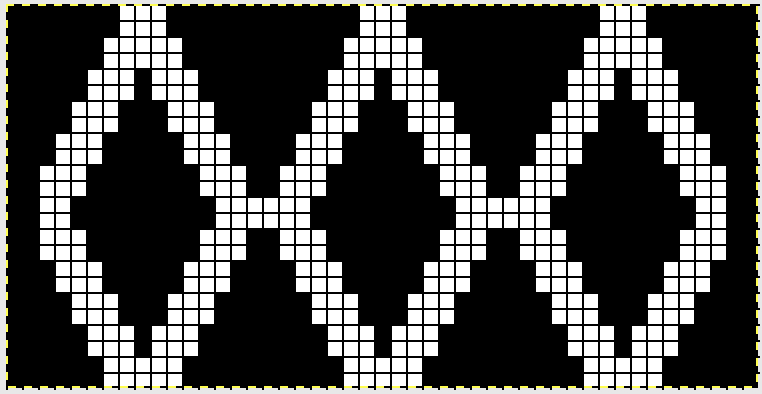 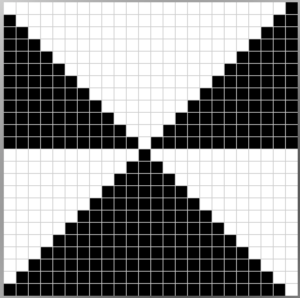 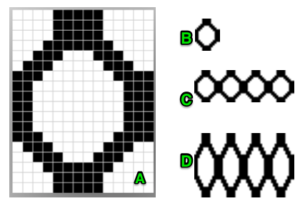 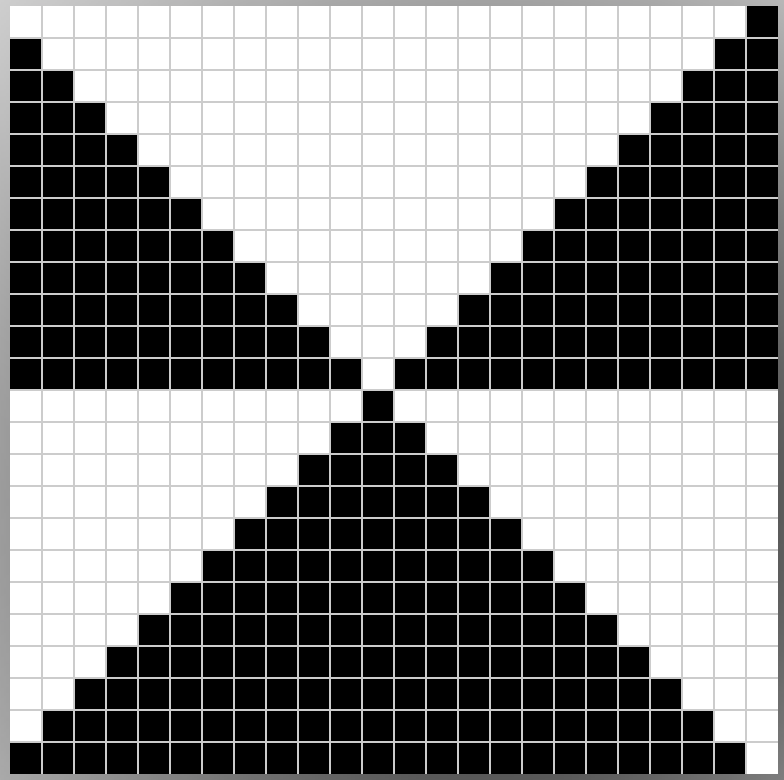 In principle the black squares in the illustration represent knit rows, and their number is easily enough adjusted in height. 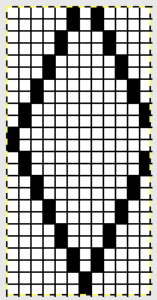 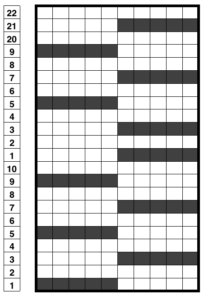 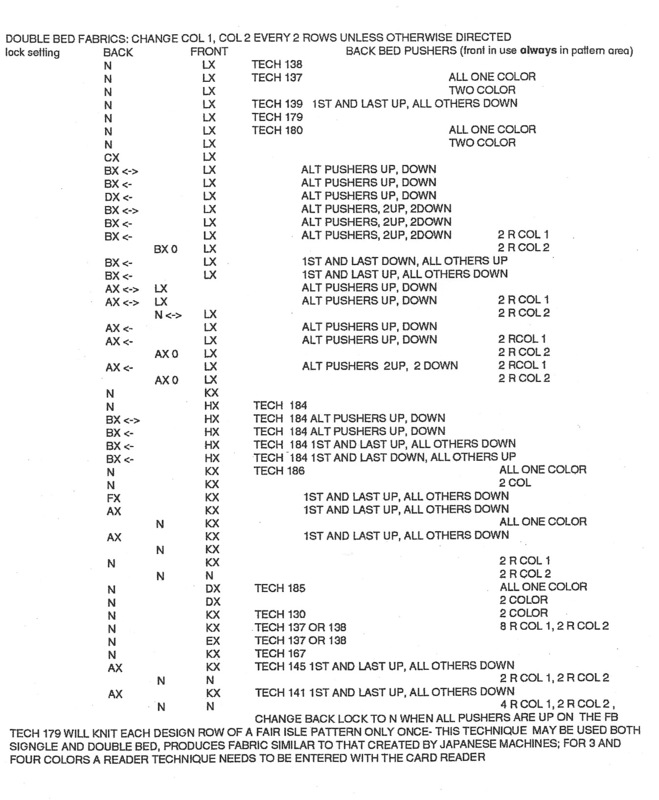 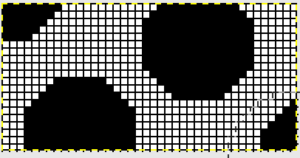 Punchcard users would need to punch holes for each black square, mylar user can fill in the white squares for a single repeat, add blank rows at top or bottom, and color reverse when programming. 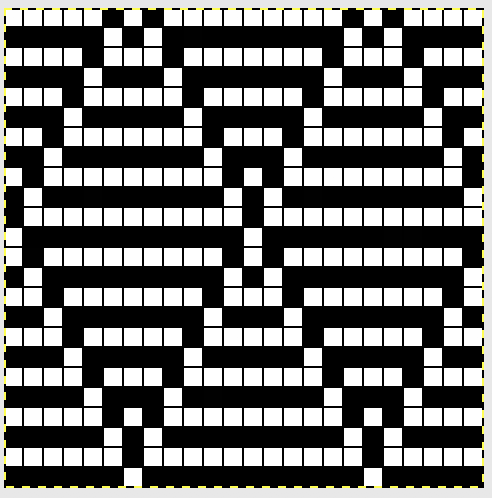 In Ayab software the repeat has to be drawn for the width of the piece, but will repeat “infinitely” in length. 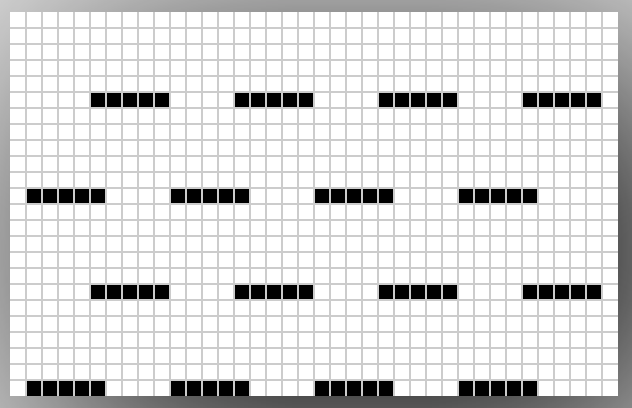 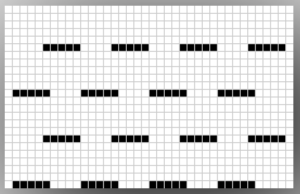 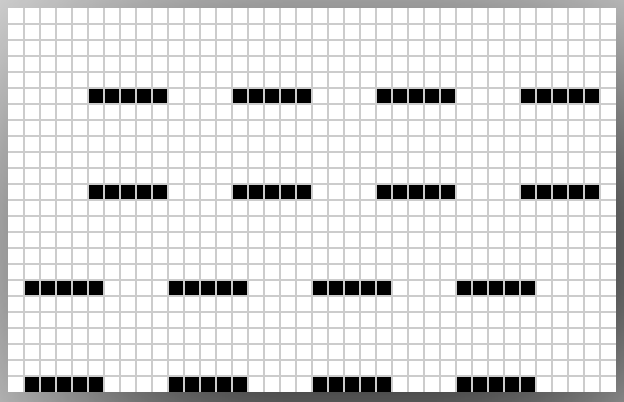 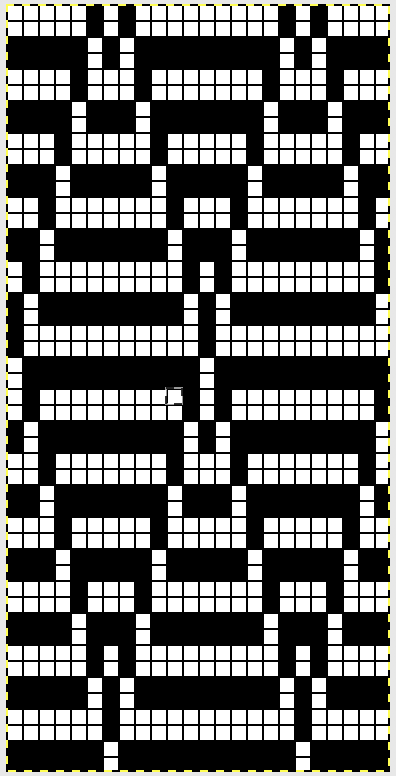 This is a possible punchcard template, with shorter racking sequence. 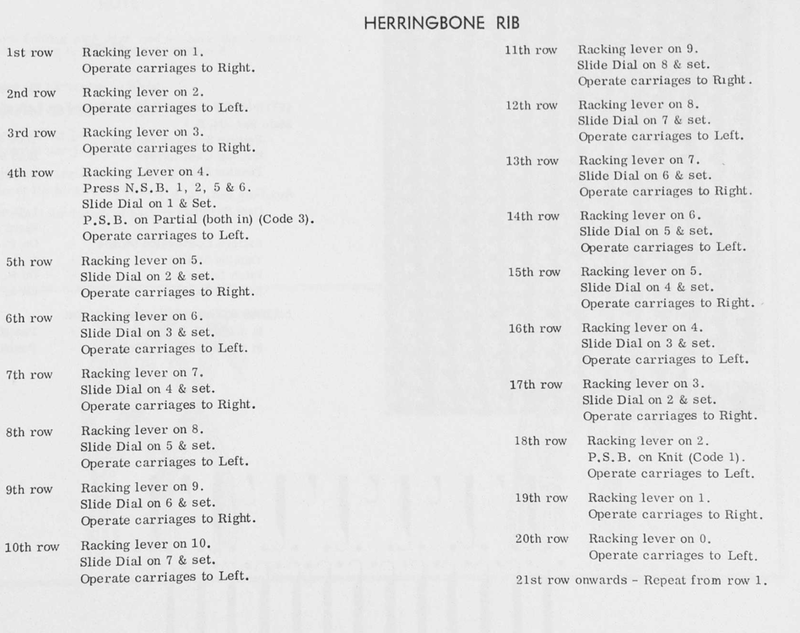 Numbered column on left indicates racking position. Pattern rows are preselected, so racking occurs prior to knitting across each row. 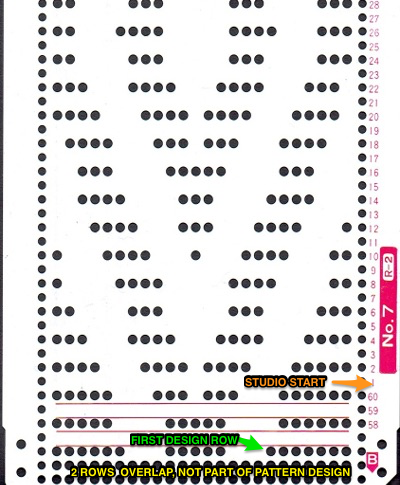 I am also in need of purchasing more punchcards or another roll, so there is no test swatch at this moment. 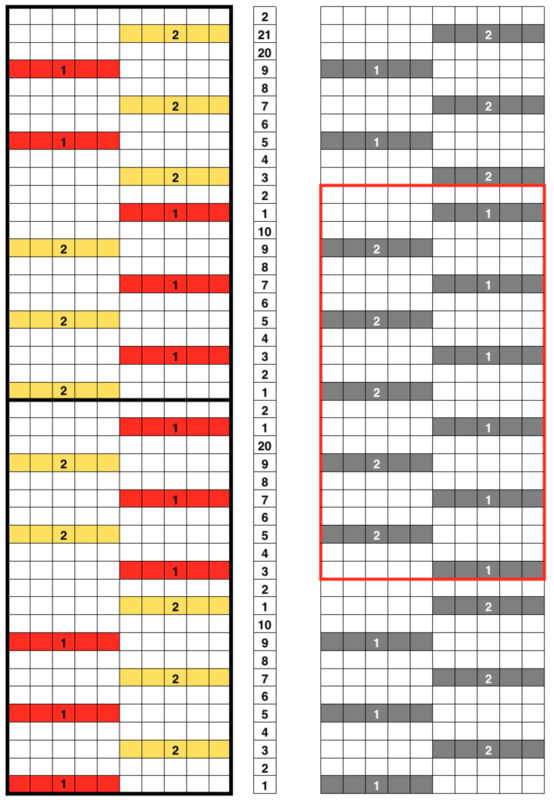 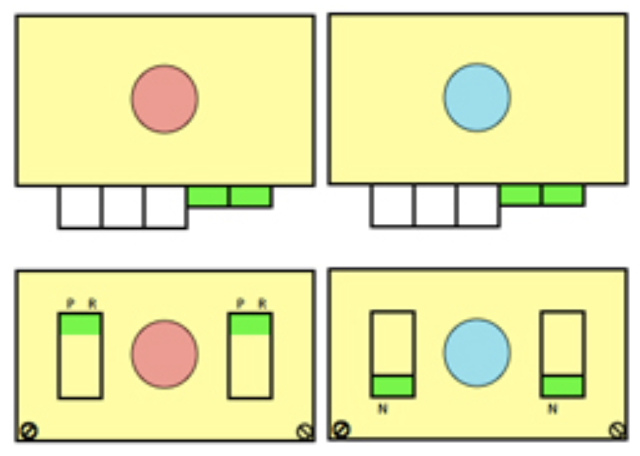 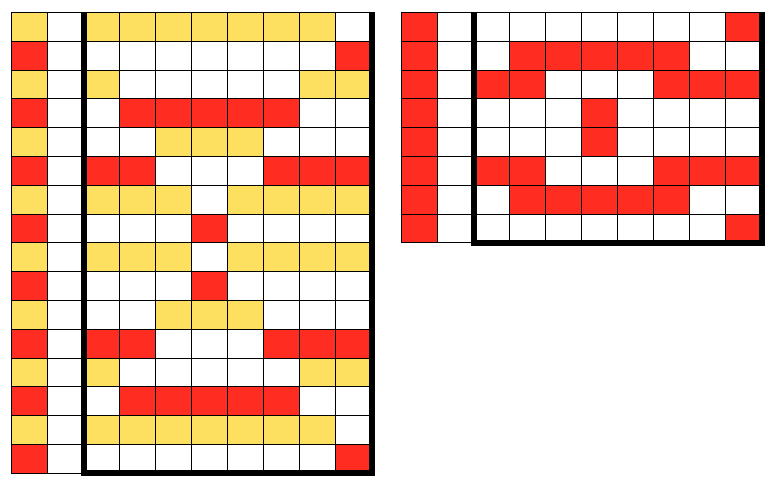 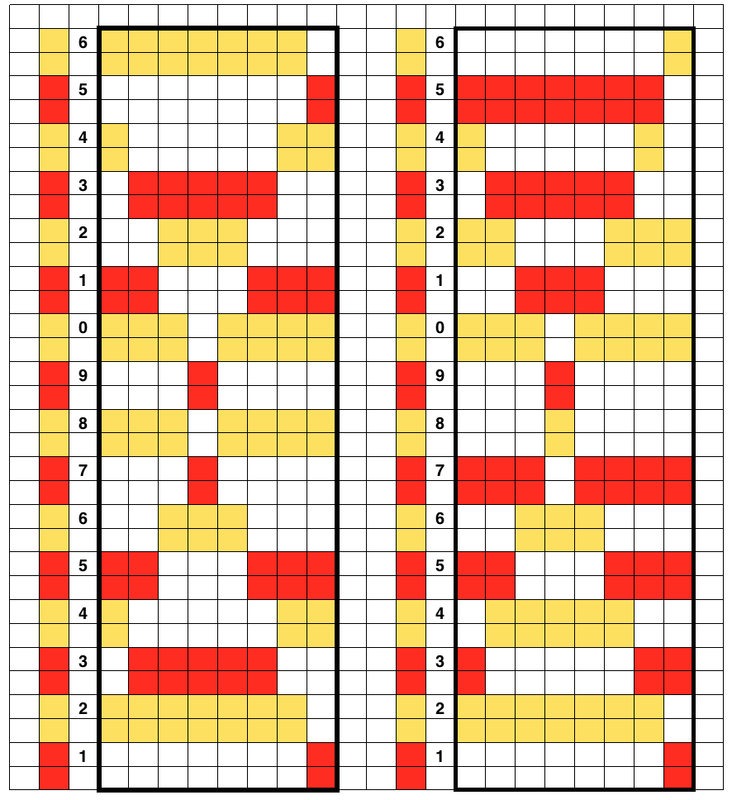 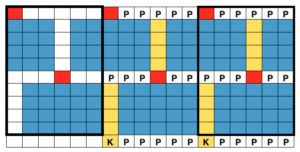 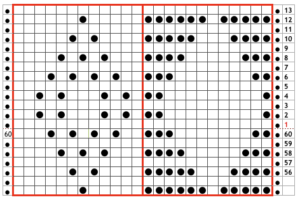 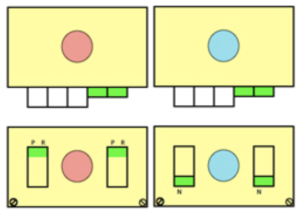 Top and bottom rows of punched holes on colored ground are not part of the repeat, they overlap the first and last 2 rows of design in the punchcard, allowing the pattern to repeat in length. 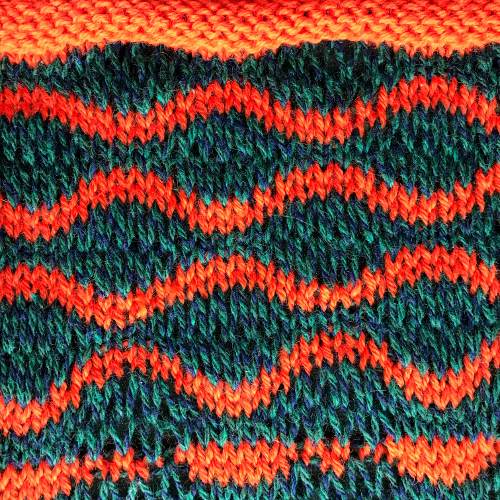 Ascending numbers swing to left, descending to right. 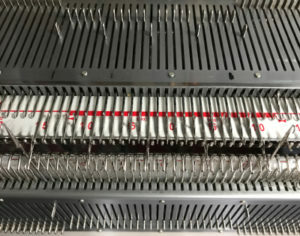 Rows may be added at level of #7 (7, 8, 9, 8, 7), so that the center of the swing may then occur on #9 positions in racking handle, lengthen the card accordingly. 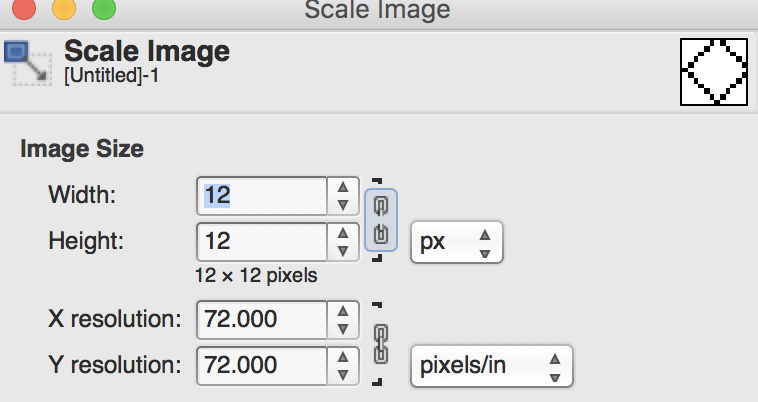 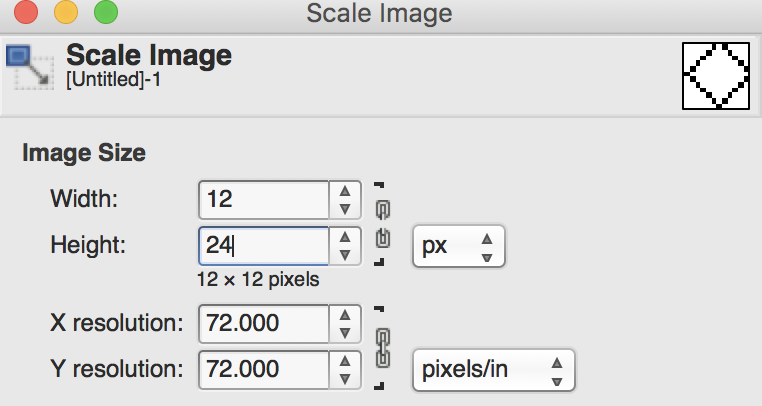 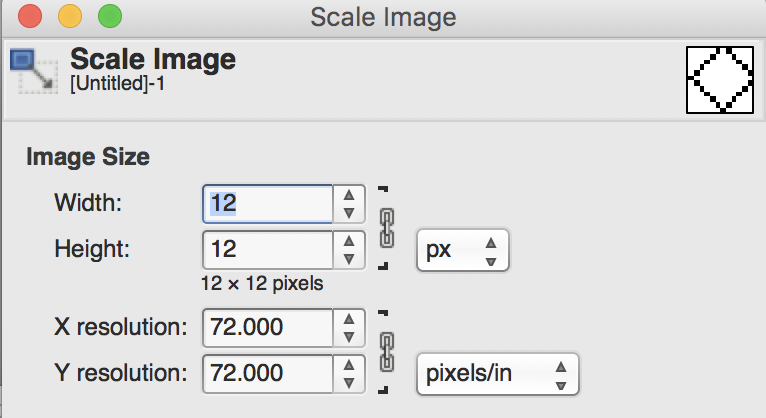 I no longer have Adobe programs available to me, for this post my images were created in Mac Pages. 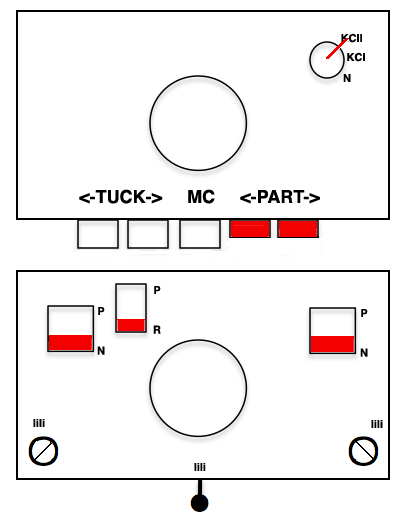 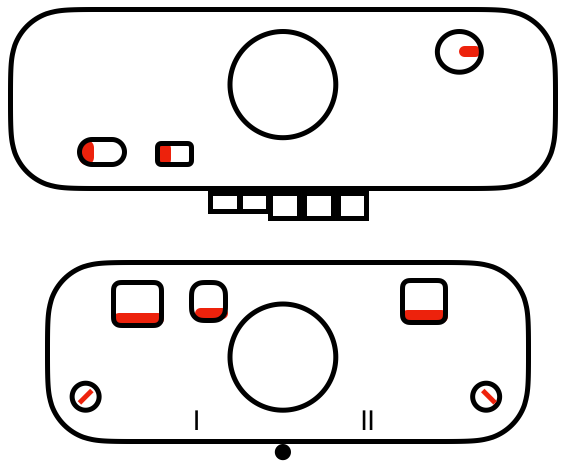 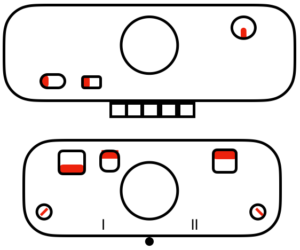 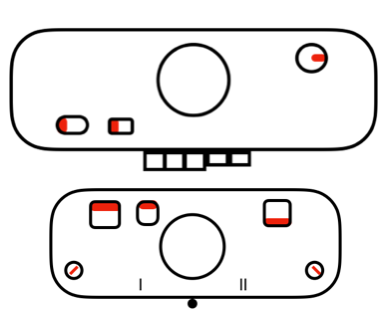 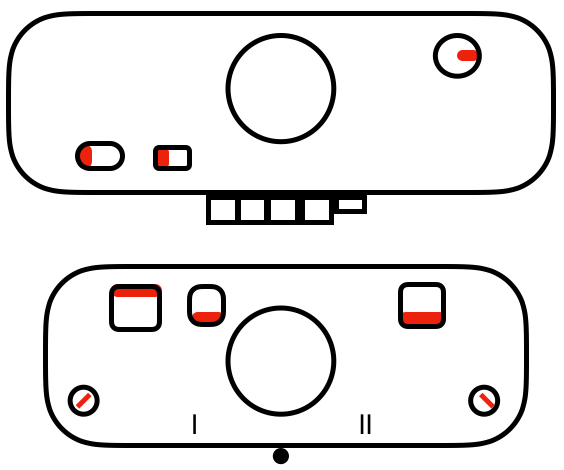 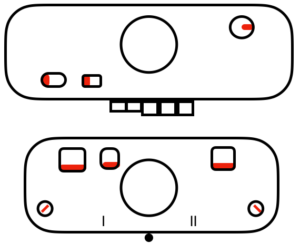 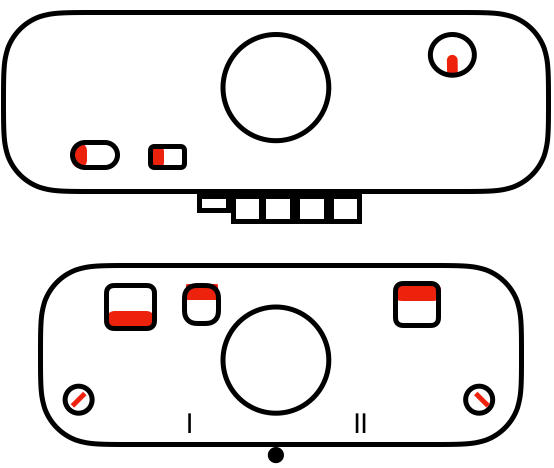 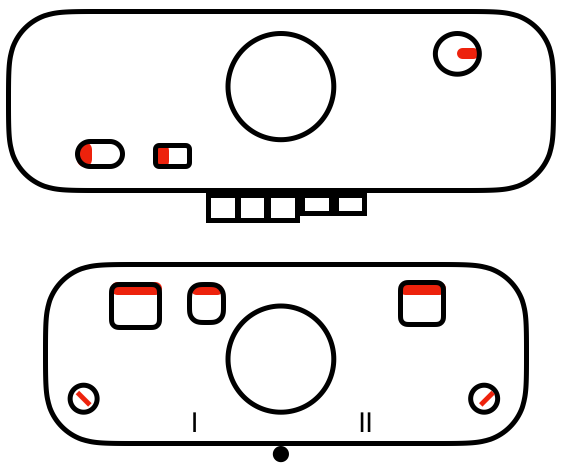 I have simplified illustrating button and cam settings in red. 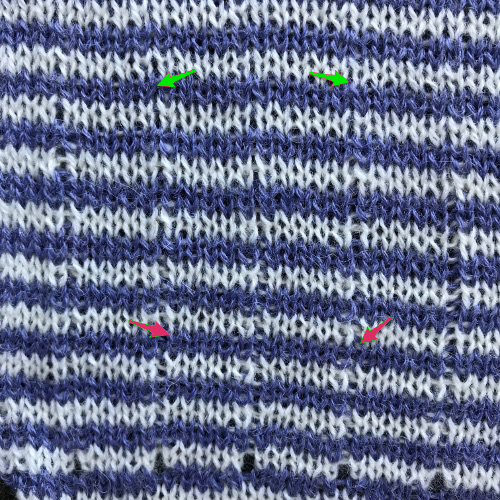 I tend to knit most if not all my rib fabrics with slide lever in the center position (marked lili on carriage, blue dot). 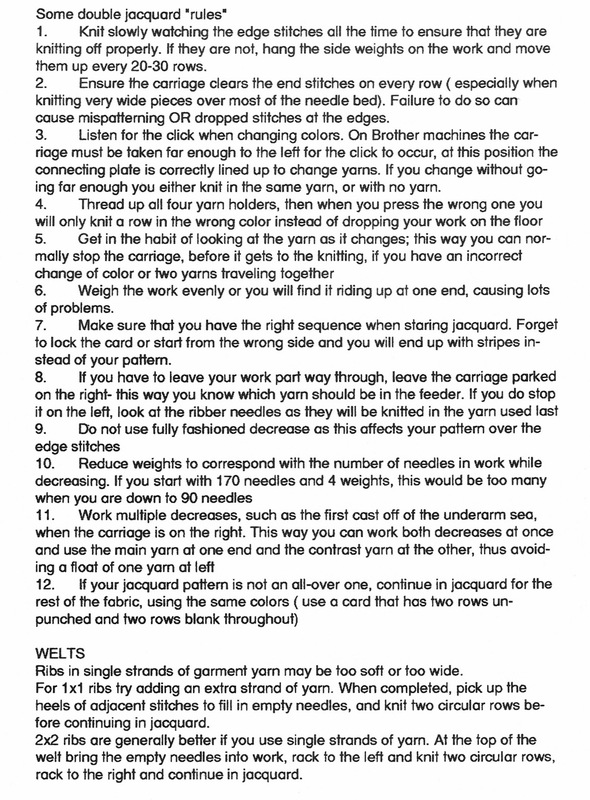 This avoids accidental changes when altering the settings for sections of garments or forgetting to reset it ie. 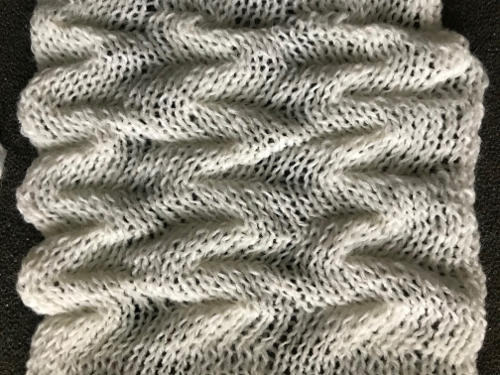 if one uses a rib band in a sweater front on one setting and accidentally uses a different one in the back, there will be a difference in width and height between the 2 bands that can be quite noticeable, and is not apparent until the garment pieces are completed and ready for seaming. 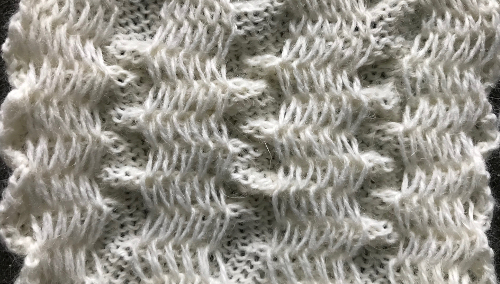 I personally never do 3 circular rows after first cast on row: it will produce a floats on one side of the rib, which may be noticeable in your final fabric on one of the 2 garment sides. 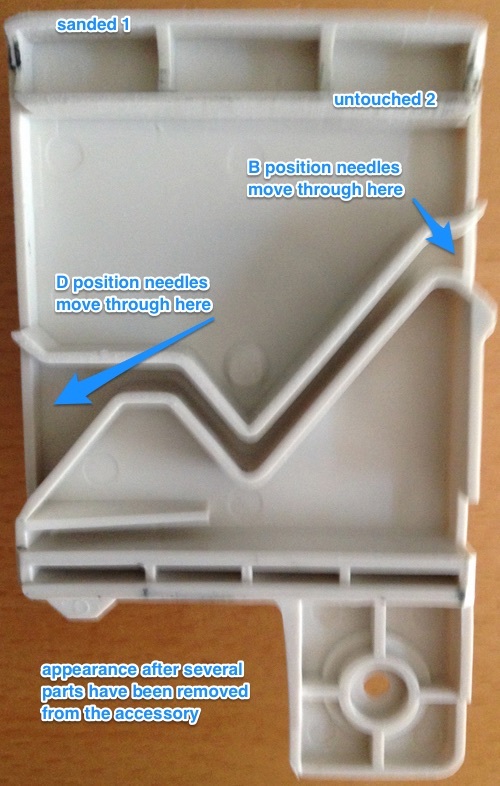 The lili buttons on the ribber are representations of an every other needle set up, akin to the 1X1 card use on the main bed. 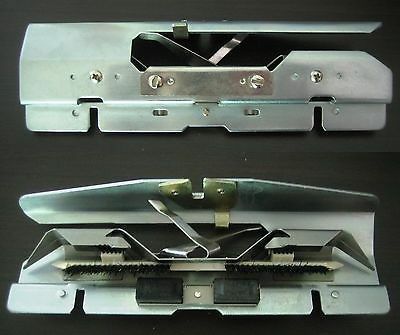 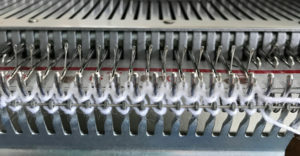 It is essential for an even number of needles to be in use when the lili buttons are in use (pushed in, and turned toward the lili markings on each side of the ribber carriage, R to R, L to L). 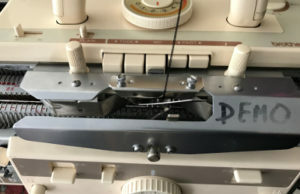 An easy way to insure the even number is to look at the needle tape markings, which alternate between dashes and blank spaces between them. 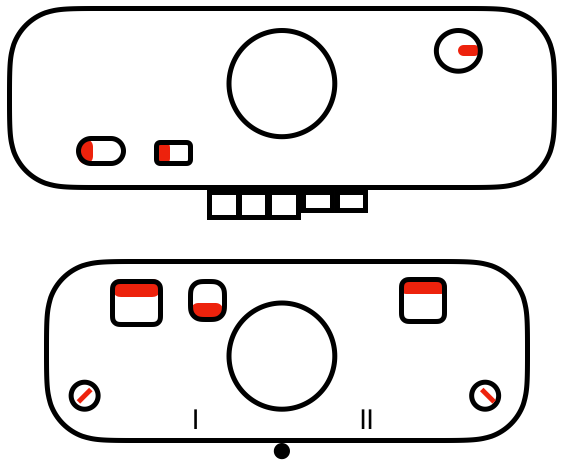 A line/ dash and a space make a pair, so if you start with a needle on a line, the last needle on the opposing side needs to be on a blank space, or vice versa. 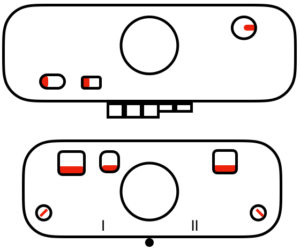 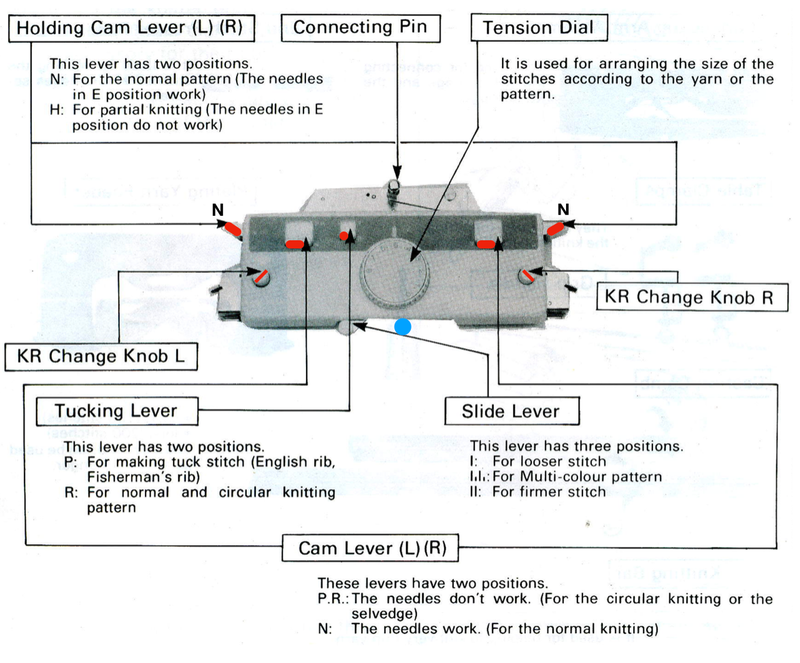 The holding cam lever remains on N position throughout these illustrations. 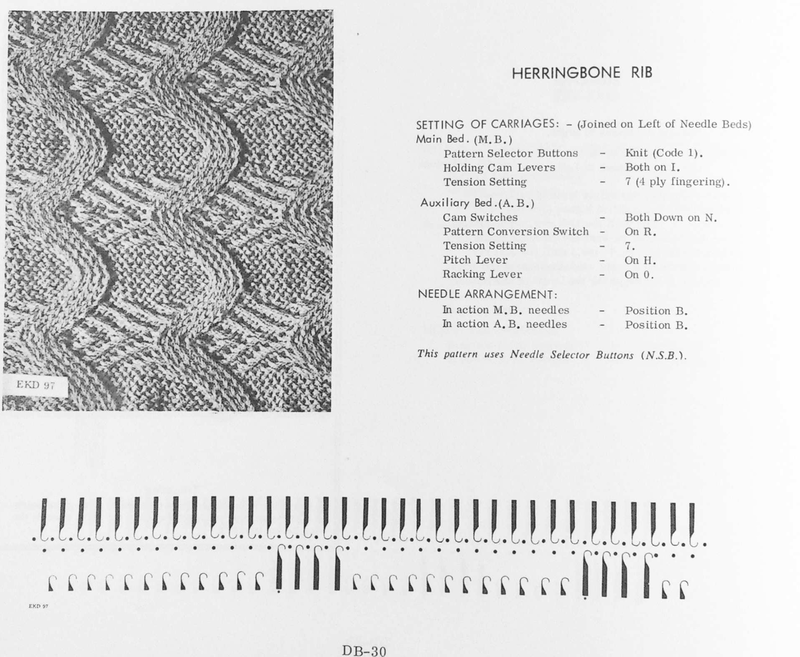 Setting for tucking on ribber: it is possible to tuck on every needle on either bed when knitting every needle rib, as long as the needle on each side of the stitch forming the tuck loop on the opposing bed is creating a knit stitch, anchoring down those tuck loops on each side. 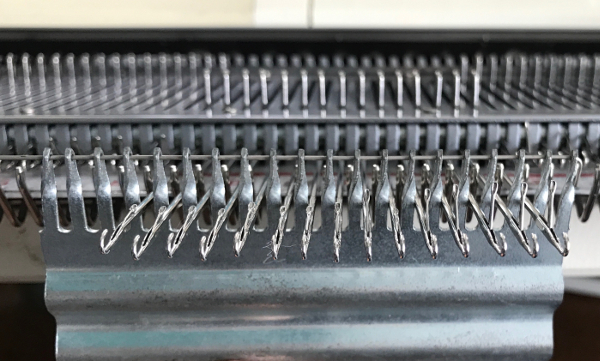 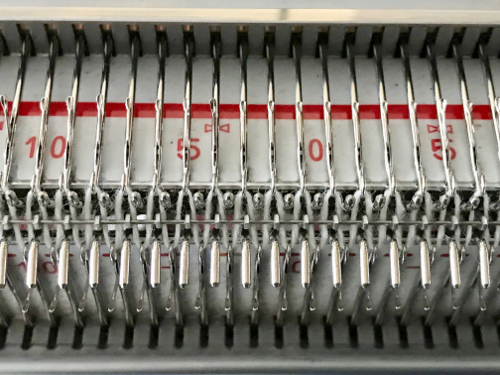 The most balanced fabrics are achieved when no more than 2 colors on any single design row are used, and the number of rows knit on the ribber total the same as the number of rows knit on the main bed. 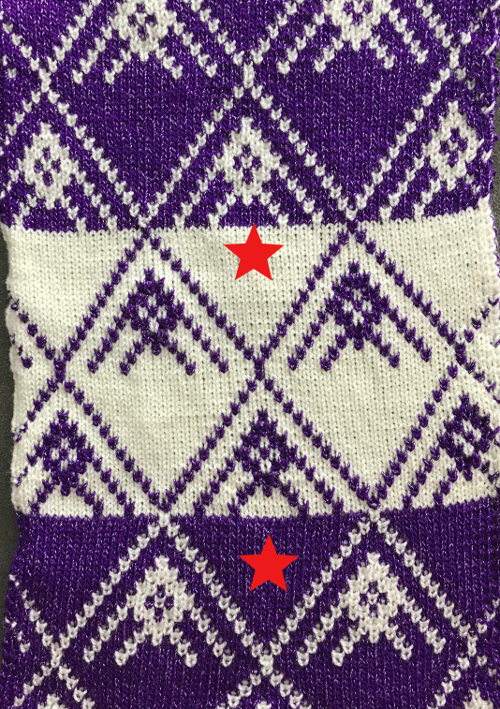 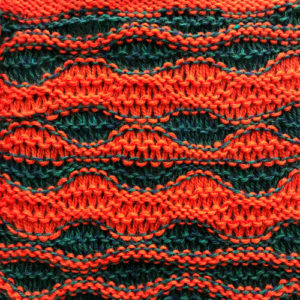 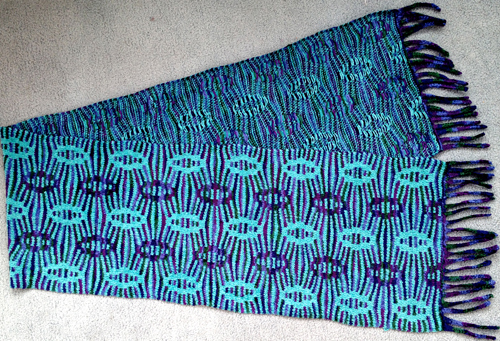 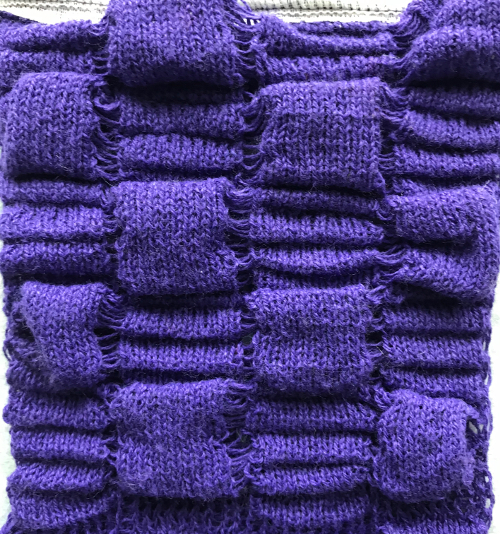 It is possible to knit designs with 3 or more colors per row. 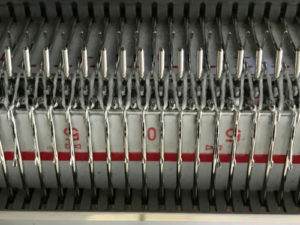 With Japanese standard machines this would require a color separation, automatic ones are limited to 2 colors per row (Passap built in techniques have a range of other options). The more strands of yarn, the thicker and heavier the fabric, with distortion in the aspect ratio of the design. 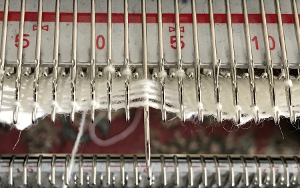 As with single bed fabrics, double bed slip stitch creates knits that are short and skinny, tuck creates short and wide ones. 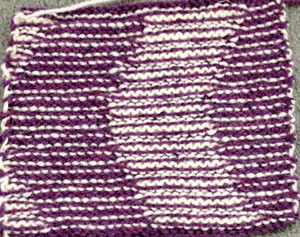 As stitches slip, tuck, or get longer there will also be “bleed through” of the alternate color on the front, “knit” face of the fabric. 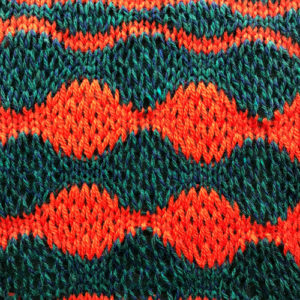 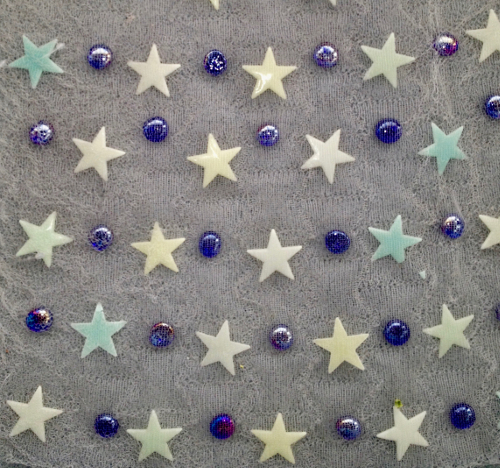 In small, balanced repeats this can create a color mix that may make the result either interesting or confusing. 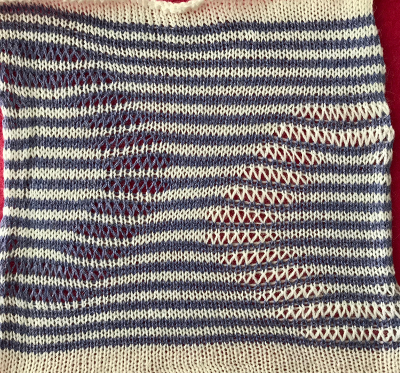 Garment swatches need to be larger than usual for single bed. 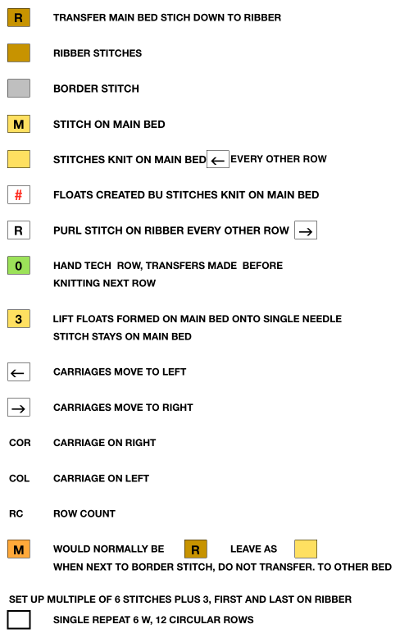 I tend to use at least 80 or 100 stitches/rows on both beds to calculate garments. 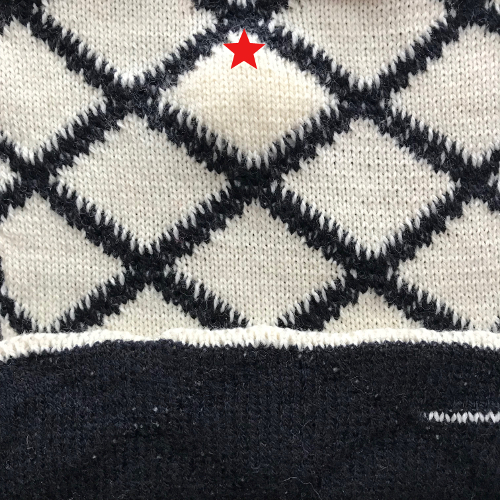 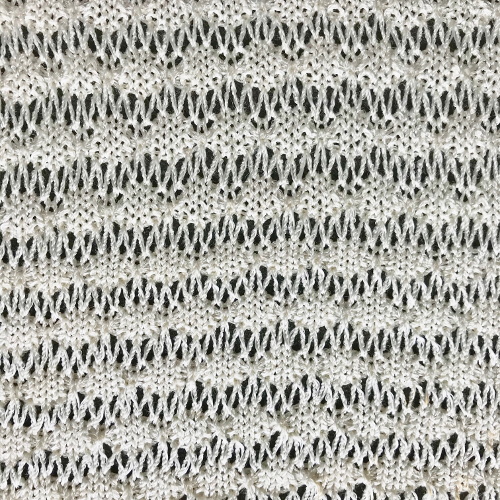 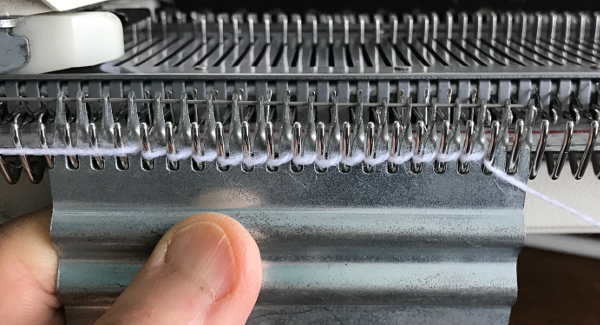 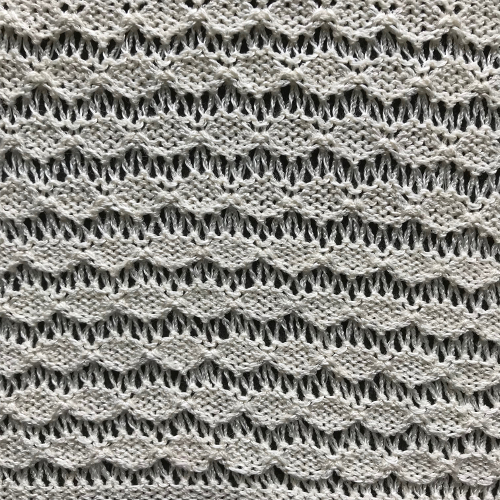 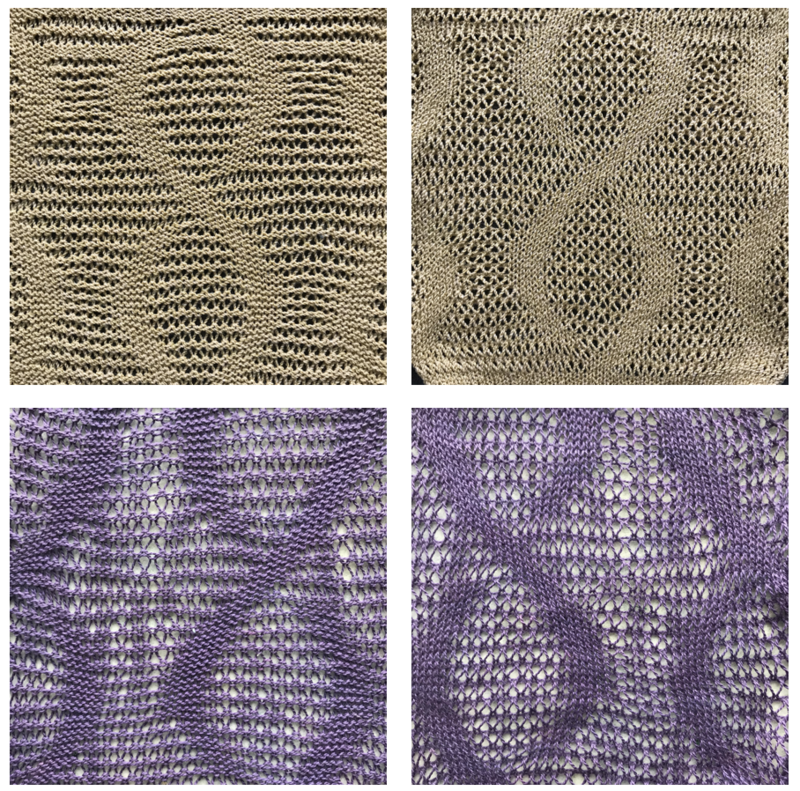 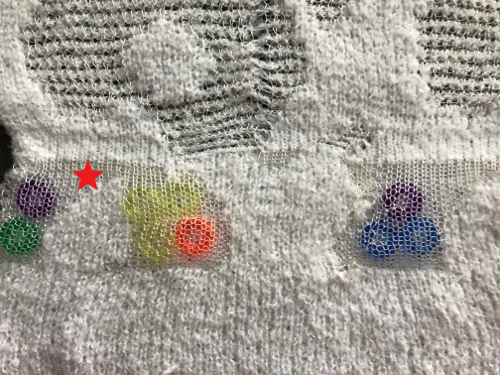 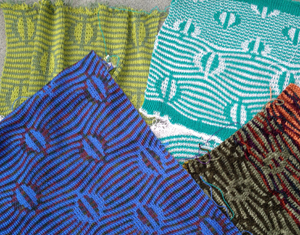 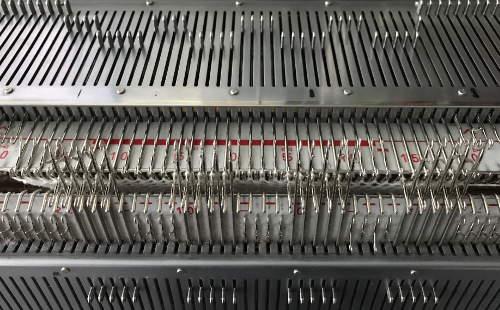 When using no more than 2 colors per row, Japanese machines offer the option of a color separation that knits one design row per row, which is an added way to reduce motif elongations in the finished knit. 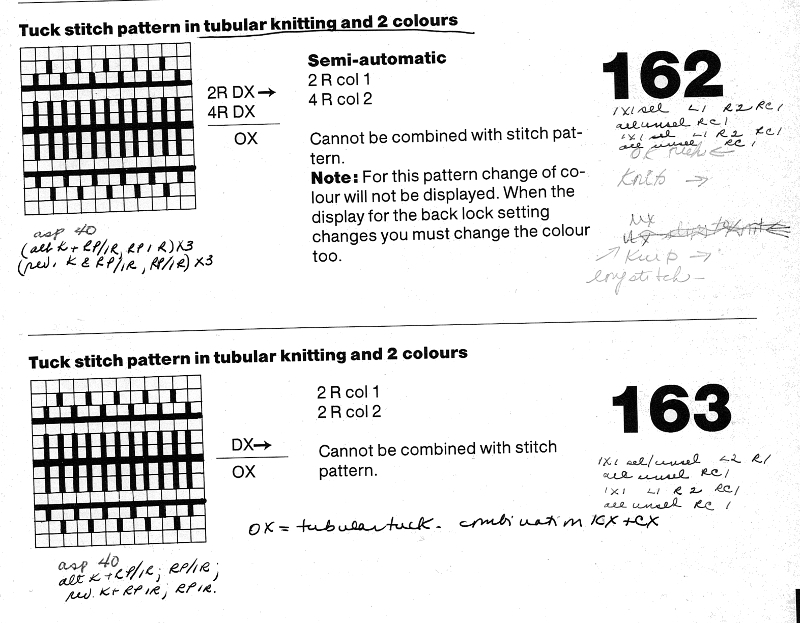 Passap knitters may use tech 179 to achieve the same result. 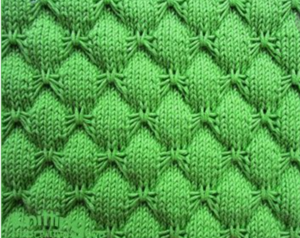 For different separation methods for double bed fabrics see color separation posts on them. 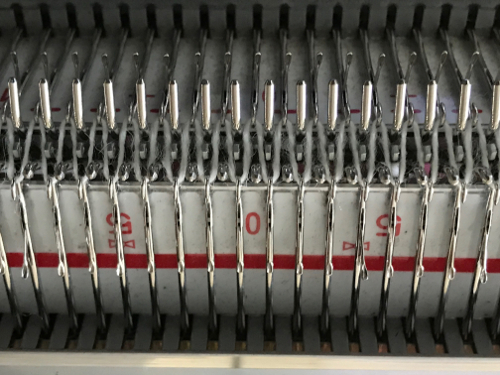 solid backing: the part buttons on the ribber are reversed manually on the left side of the machine when the color changes are made. 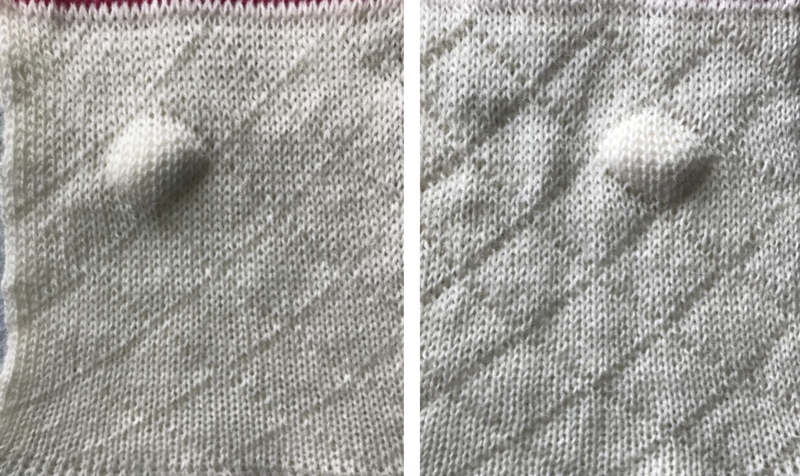 The solid backing color knits on the ribber when both part buttons are down (N<–>N), the second color will be slipped with both the part buttons in the up position. 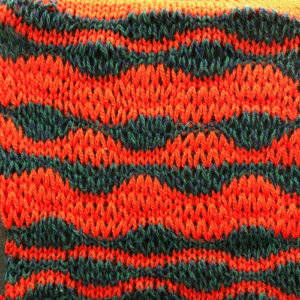 For an interesting effect use wool for solid back color 2, other fiber for color 1, and felt result. 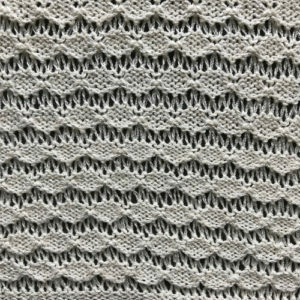 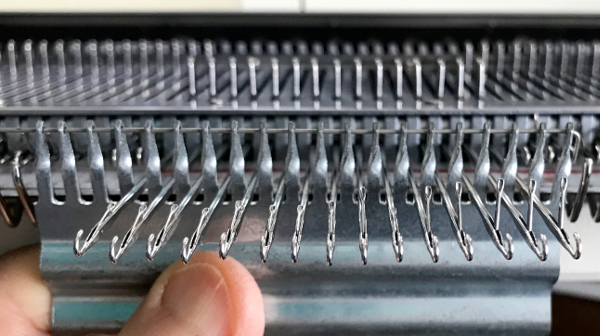 See altering a sinker plate for producing this fabric using a second KC to knit rows only on the top bed, no ribber setting changes required. 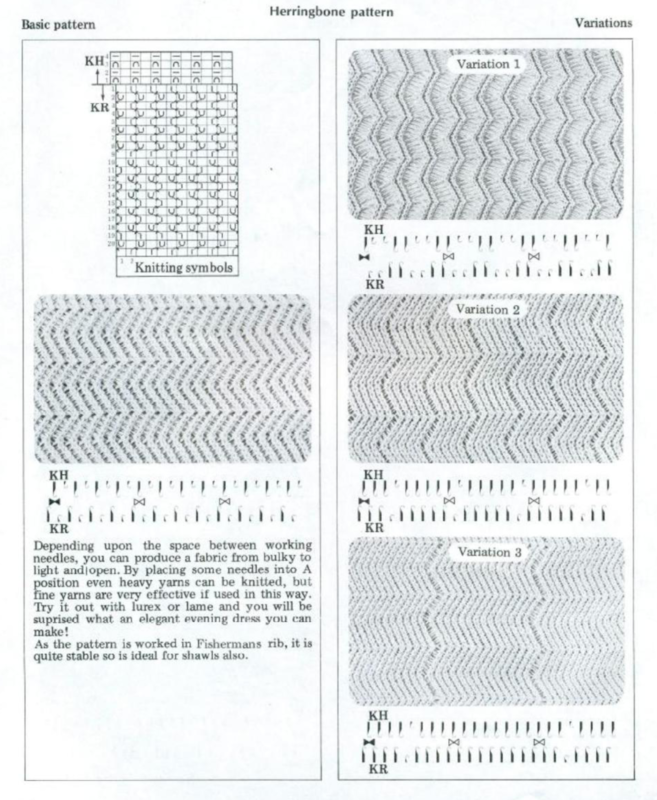 Vertical striper backing and “ladder back” variations involving some hand manipulation and selection of needles in work are also alternatives for DBJ backing. 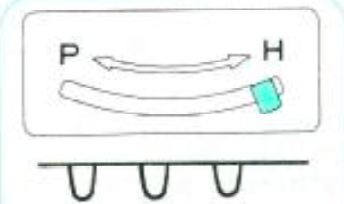 I have for decades and in my posts referred to this part as the ribber sinker plate; technically it is called the connecting arm in the Brother literature. 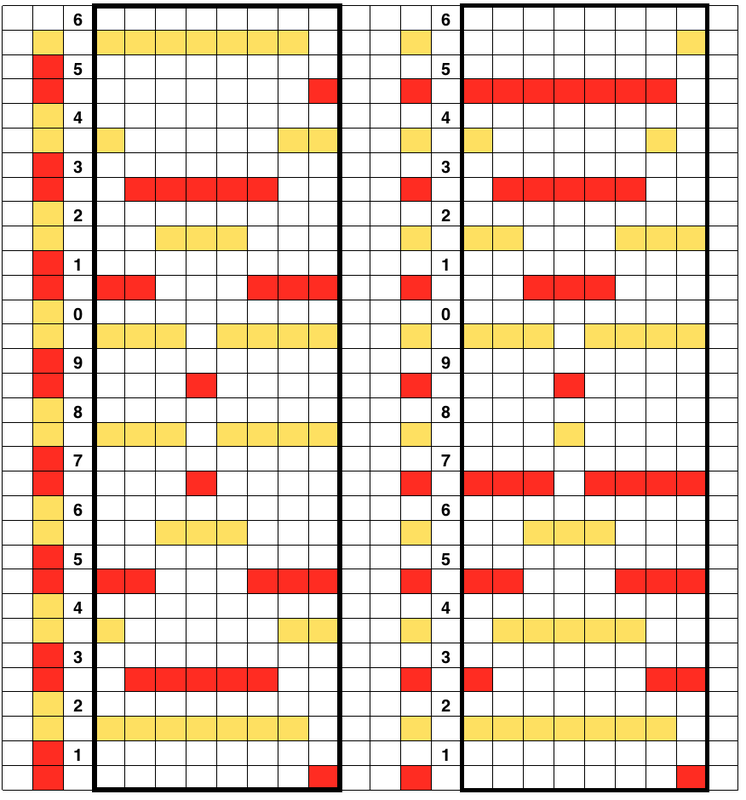 There were slight differences between model years for them as well. 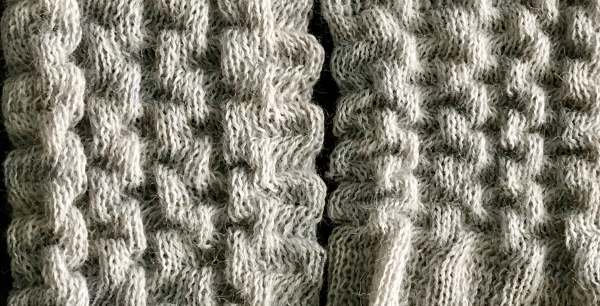 Later connecting arms were branded with the number 2, earlier ones were not. 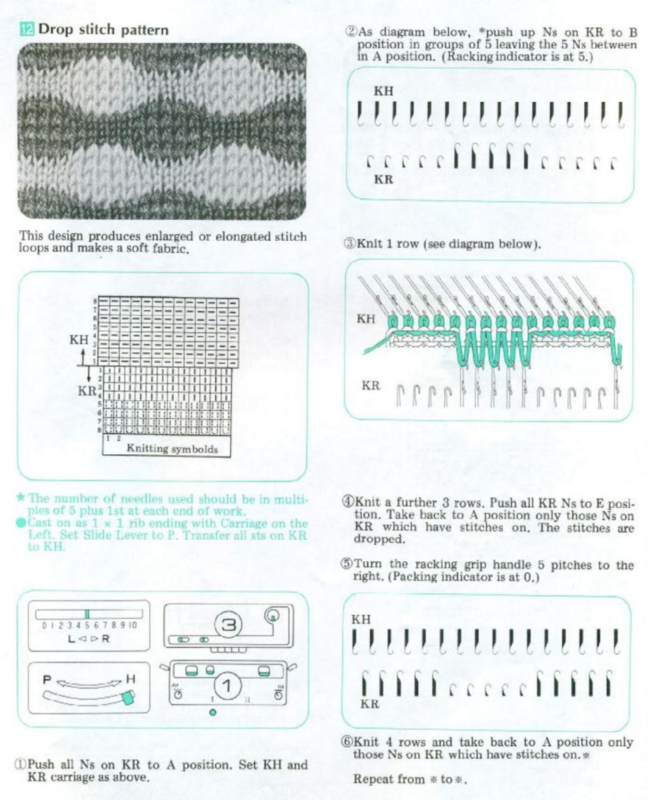 Hand knitters may be familiar with drop stitch patterns where the yarn is wrapped multiple times around the knitting needle, followed by knit stitch(es). 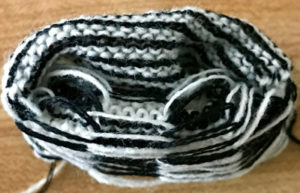 On the next row, when the wrap is reached, the extra wraps are dropped off the needle, and the remaining single loop is knit in the regular manner. 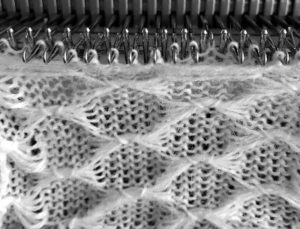 On the knitting machine this technique is called drive and mesh lace, release stitch or summer fair isle by Passap, and drop stitch lace in some of the pattern books. 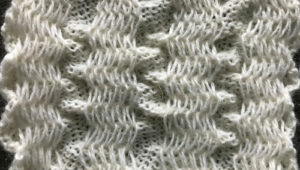 Drive lace typically has lines of patterning where loops are formed between rows of all knit stitches. 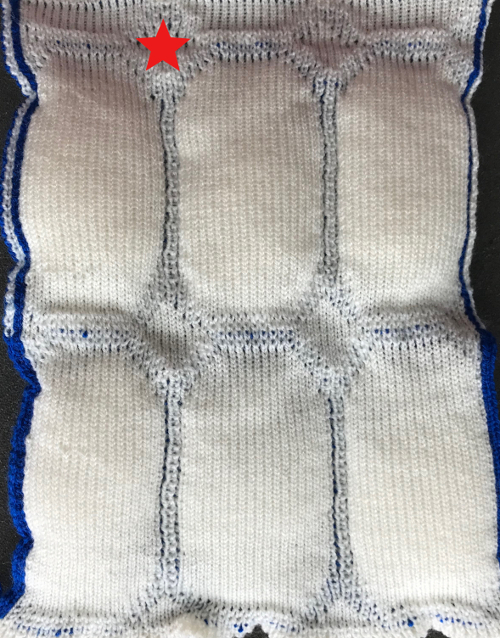 The main fabric, usually stockinette, is knitted and produced by either bed. 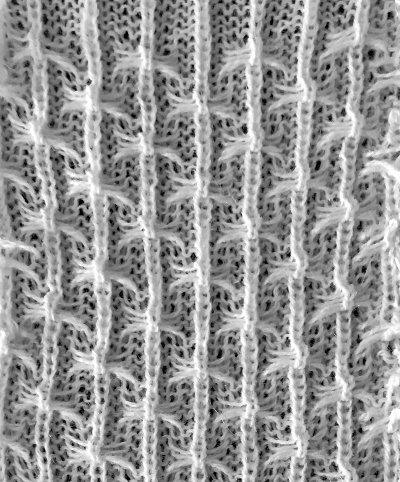 Selected needles knit pattern stitches on the other bed for one or more rows, then are dropped from those needles, unraveling back to their starting point, creating the larger, open stitches. 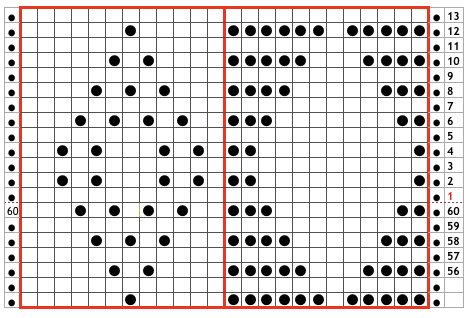 Sometimes a distinction is made between terms used, in drive lace the bulk of the punchcard is left blank, there are far fewer marks than in drive lace. 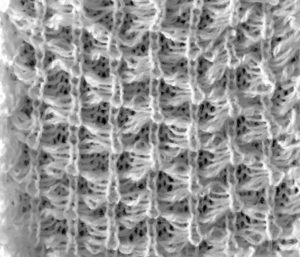 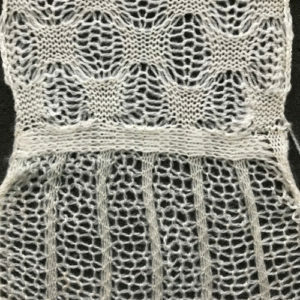 In mesh lace the balance of holes to punched or blank areas is 50/50 or more punched areas than blanks, often the “holes” or black squares are side by side. 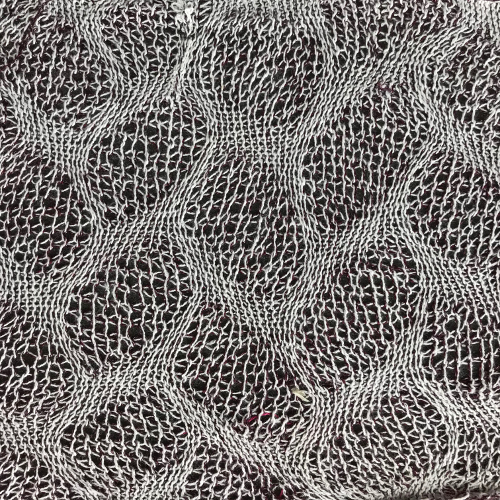 Drive lace marks out the shape of the pattern, mesh forms the background. 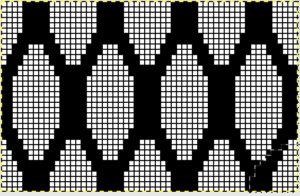 Blank rows across the width of the repeat allows the knitting of plain rows between dropped stitch including ones, separating the the series of holes, or stabilizing the fabric. 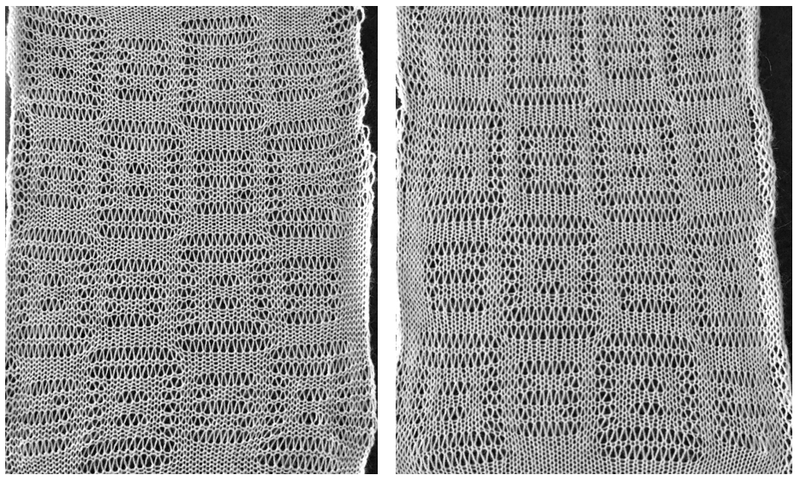 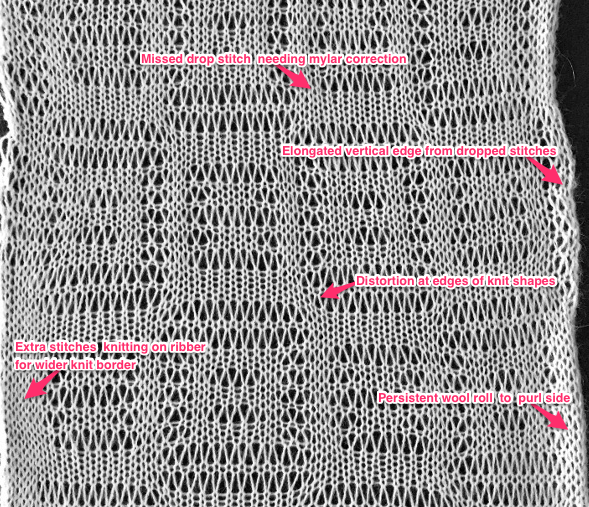 Both types of mesh may be combined in the same fabric, with dropping planned on same rows. 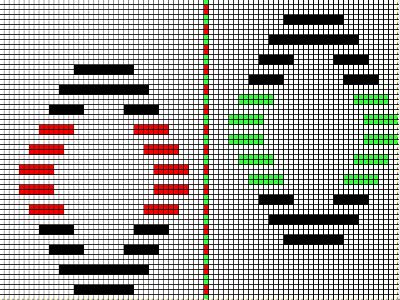 The diamond on the left represents drive lace, the one on the right a mesh version. 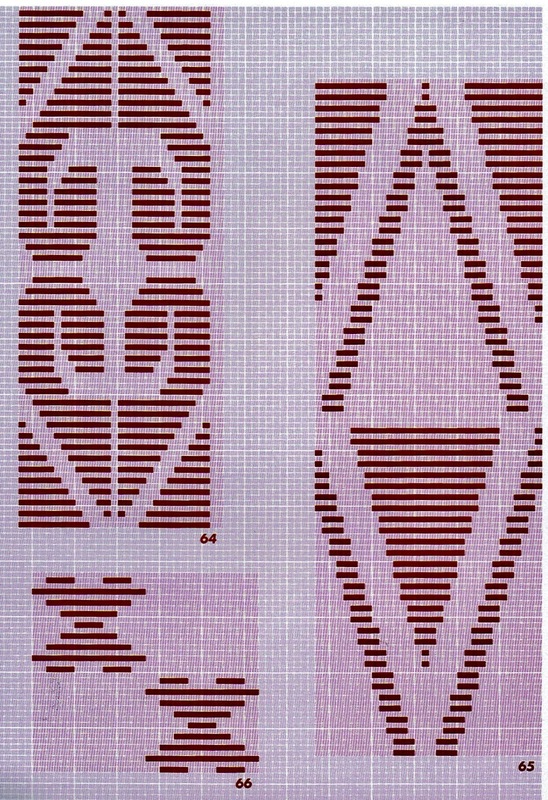 On the right, solid “lines” echo the shape. 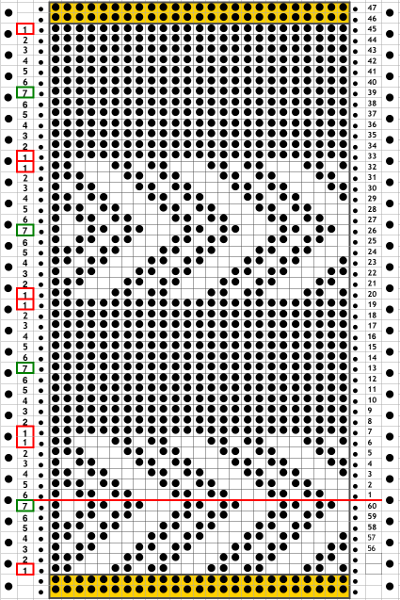 Repeat is suitable for punchcard, but may be altered to suit for both cards and electronics. 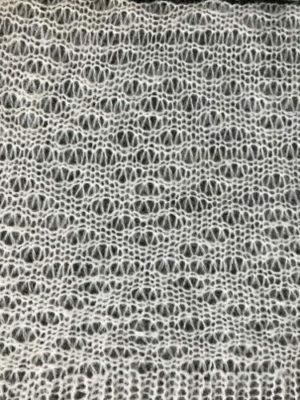 The fabric may be created both as a hand technique or using automated patterning. In sources that show loops being formed on the ribber, stitches are released by uncoupling the ribber carriages and moving the it across the knitting and then back to its original spot, thus dropping the stitches. 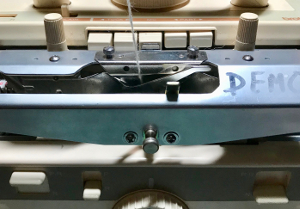 In studio machines the P carriage may be used to drop stitches, see previous posts on modifying one for use on Brother KM. 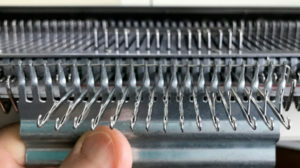 The tension setting on the patterning bed affects the loop size and its tension is frequently one to three numbers looser than the all knit bed tension. 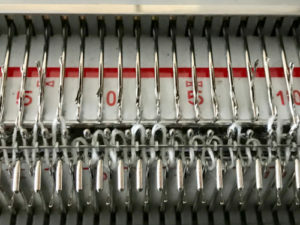 In Brother machines the ribber knits at a tighter gauge than main bed, so take that into consideration and adjust it when knitting all knit rows on every needle on the ribber, where the tension may need to be loosened one or more numbers than when knitting same yarn in stocking stitch on the main bed. 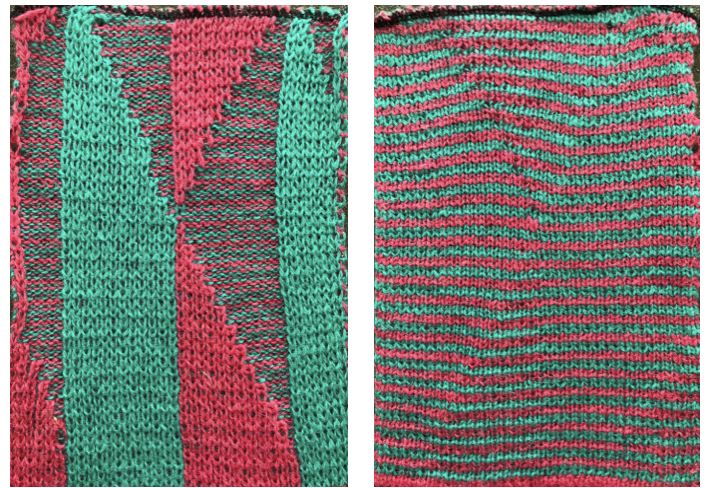 Matching tensions numbers on both beds may provide enough of a difference in stitch size for loop formation. 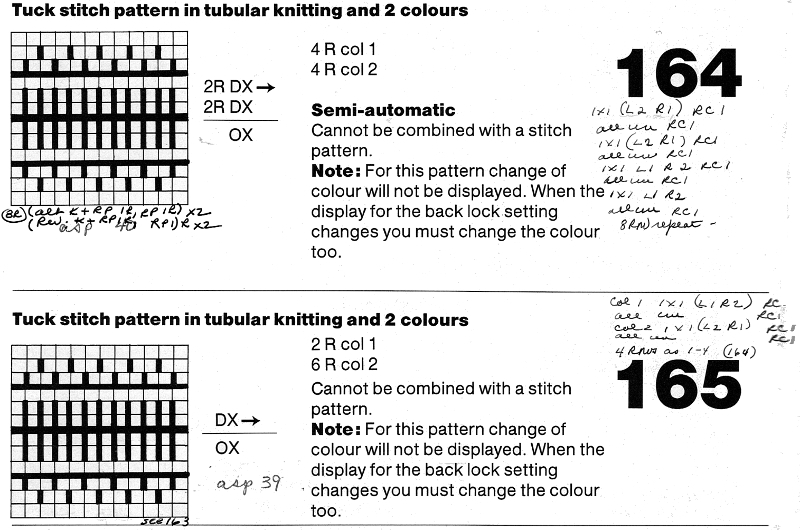 The difference in gauge between the beds also merits calculating adjustments when knitting in circular or U format. 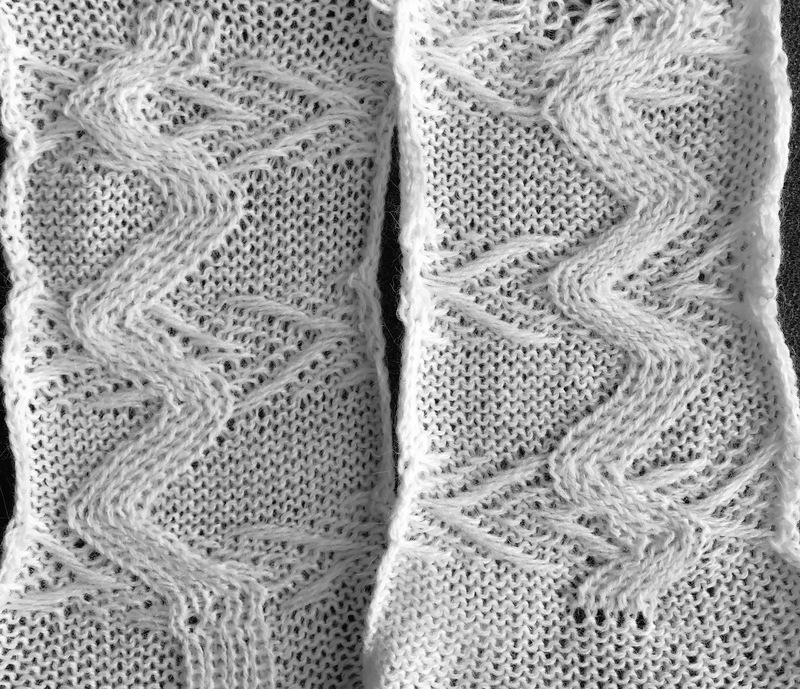 Releasing stitches may happen after every pattern row, after groups of pattern rows (such as bubbles or check patterns), or even at times when knitting is completed. 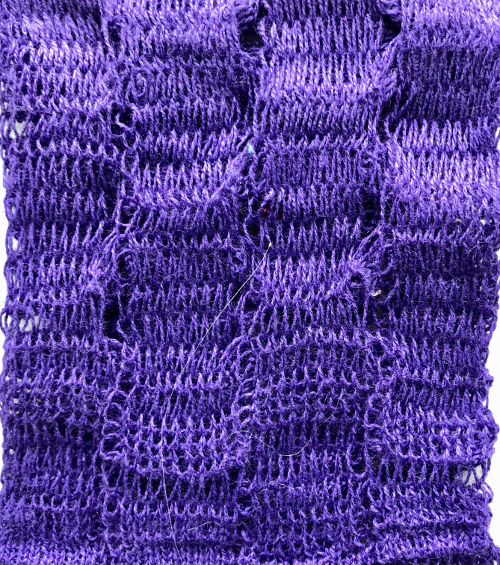 With groups of pattern rows I have had better results with more frequent stitch release. 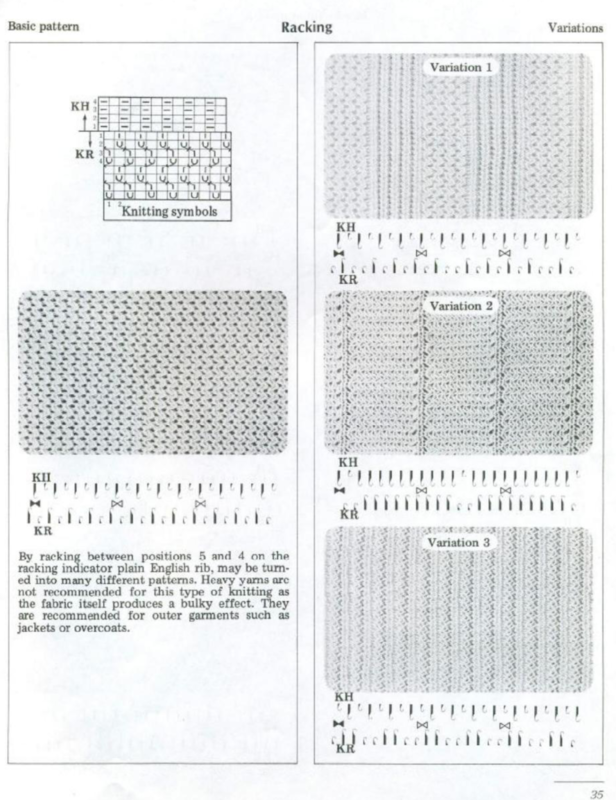 Two types of mesh can be created. 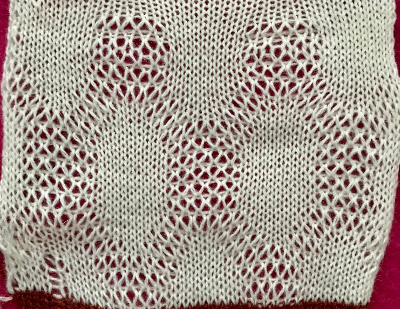 “Stockinette” mesh has an equal number of rows on both beds. 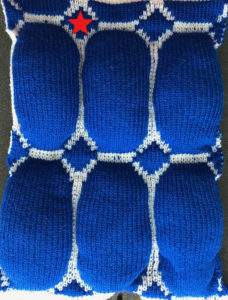 The result is enlarged “stocking” stitches along with narrower, single bed ones on any one row. 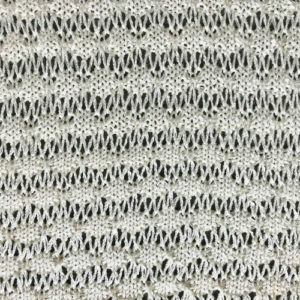 Half Milano mesh has a horizontal ridge on the purl side with 2 rows knit on the all knit fabric bed, to every one row on the patterning bed. 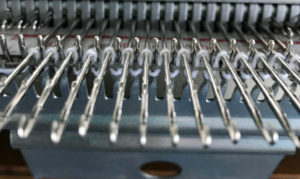 One of the rows has the patterning bed slip every needle, with the ribber only knitting, the second row forms the combination size stitches as discussed previously. 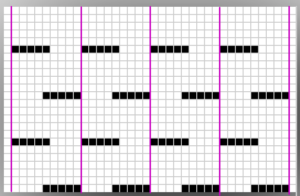 In patterning in Brother KMs this would need to have such rows added to the programmed design. 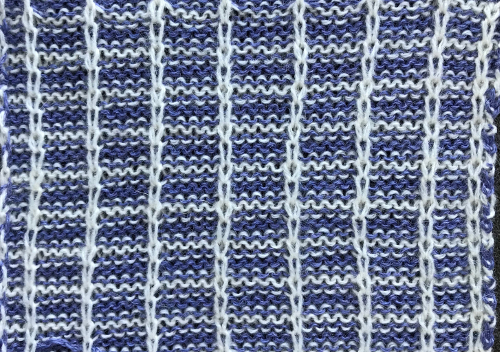 The fabric is a bit more “stable”. 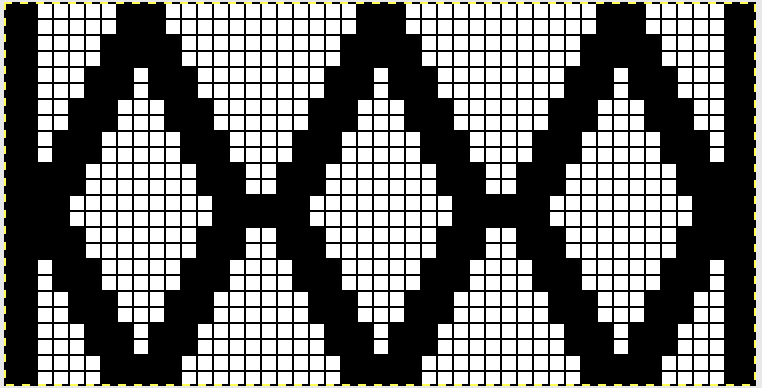 Passap offers multiple techniques for dropping stitches, often referred to as summer fair isle and using 2 colors per row. 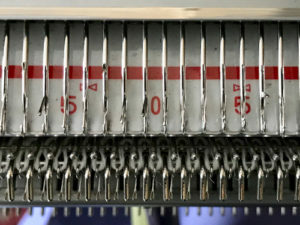 Different looks are achieved by changing built in technique number, as well as when using a stitch ditcher on every row knit, as opposed to using “empty” passes of locks to drop the stitches. 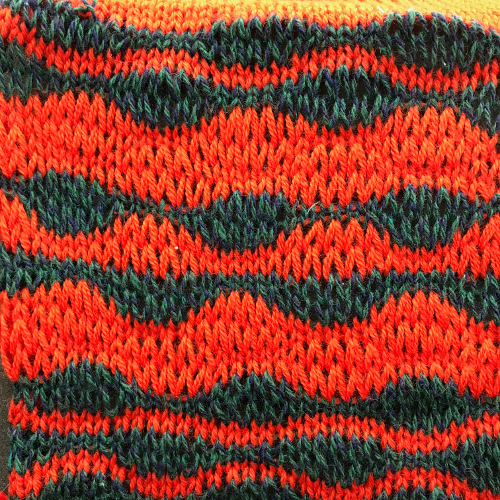 My sample was knit in a slightly fuzzy wool. 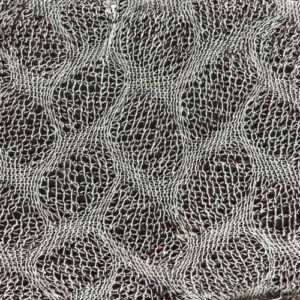 Smooth, thinner yarns result in longer stitches whose patterns get read more easily. 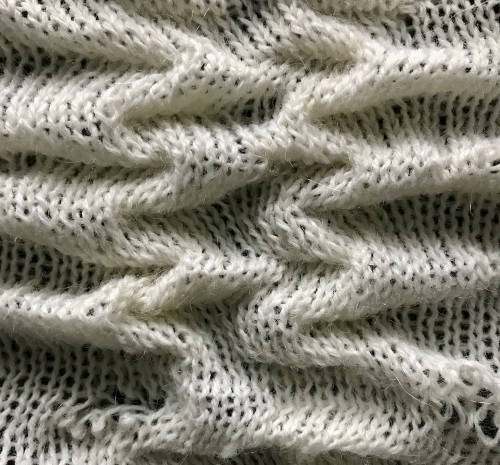 Because wool has “memory” the vertical edges tend to roll to purl side, and return to rolling even after heavy pressing and steaming. 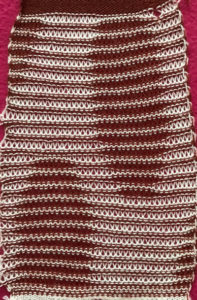 There are a couple of spots where no long stitch was created due to markings on mylar not being dark enough. 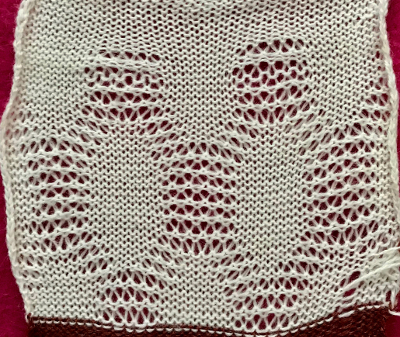 Other things to consider: this fabric widens when blocked, so cast on, bind off, and beginning and ending edges need to accommodate that. 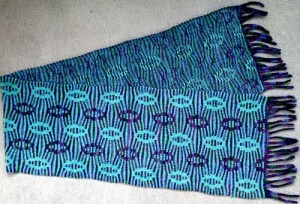 This particular design creates a fairly balanced fabric. 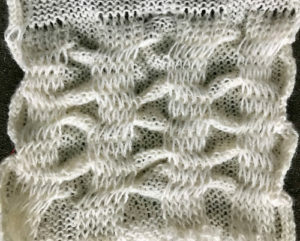 In many drop stitch fabrics, it is recommended that edges contain stitches dropped in pattern in order to maintain vertical length at edges. 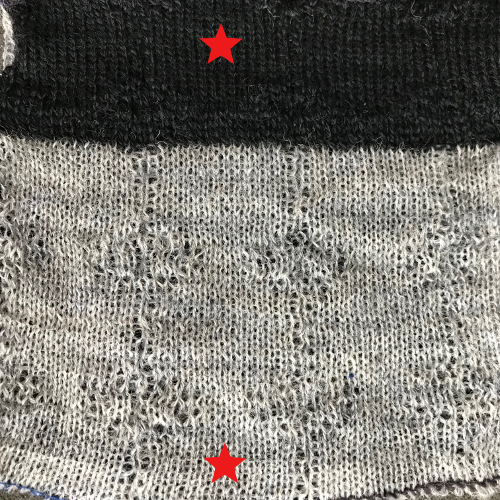 To achieve that, first and last needles on both sides should be on the main bed. 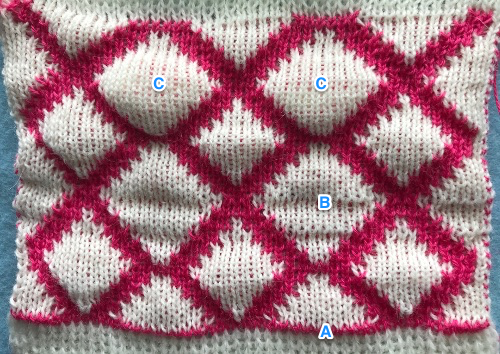 That said, having an all knit border (stitches knitting only on ribber, no dropped stitches) may work well in your pattern, or pull edges in too tightly when compared to the all over motif released repeats. 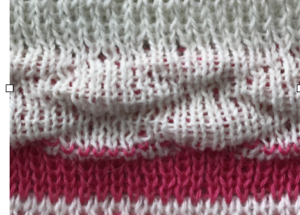 Testing on your swatch can be achieved easily by simply taking some needles on the main bed out of work on one side, thus creating the “all knit border”. 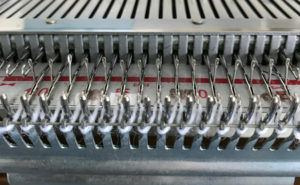 The latter can happen by accident if not all needles are returned to B position properly after dropping stitches. 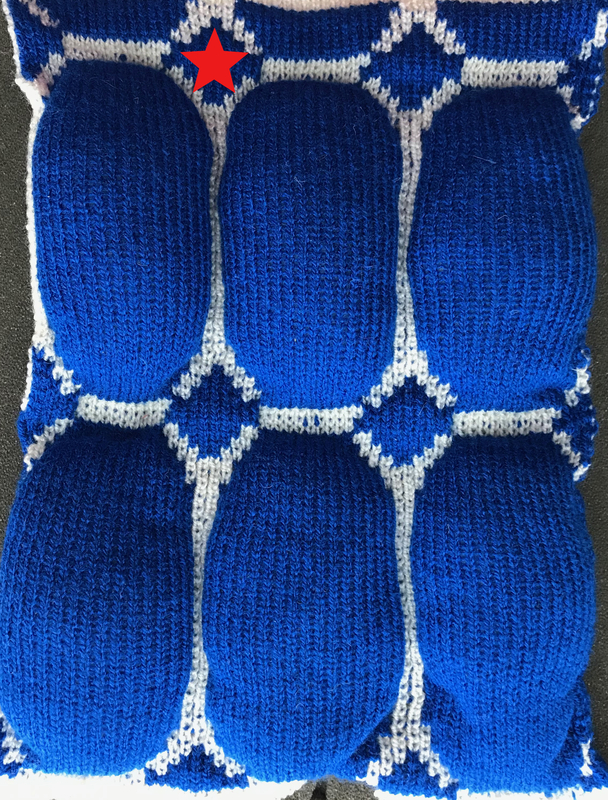 An alternative way to produce this fabric on Brother is to use the knit carriage with no yarn to do the “stitch ditching”. 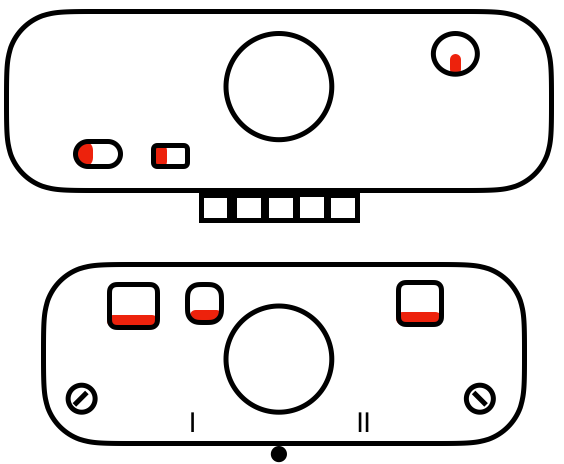 The basic design programmed into any brother machine, electronic or punchcard will need to be altered. 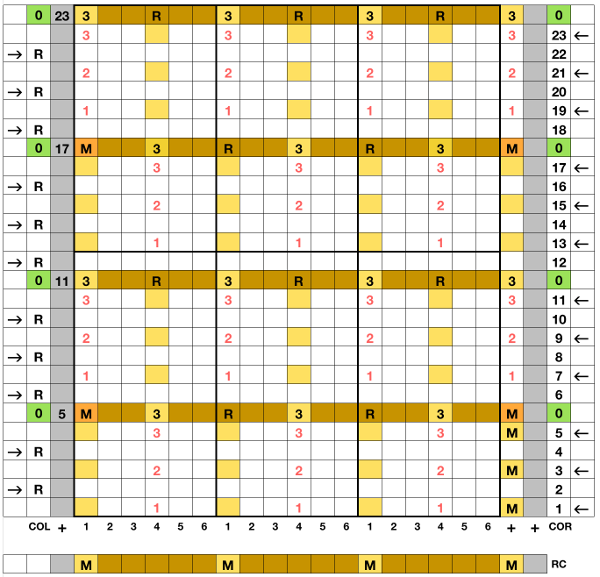 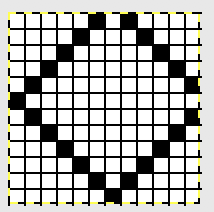 The intended design in my sample is a 4 X 4 square, colors represent what would be punched holes, black squares, or pixels. 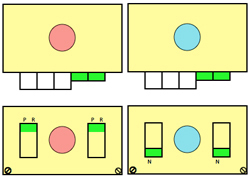 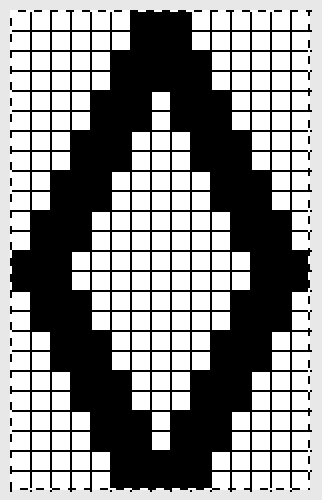 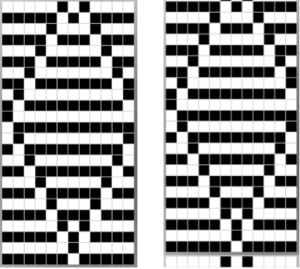 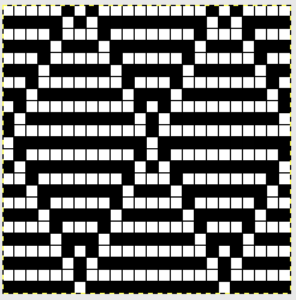 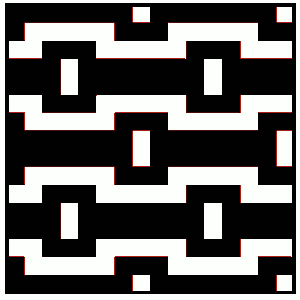 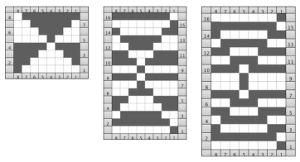 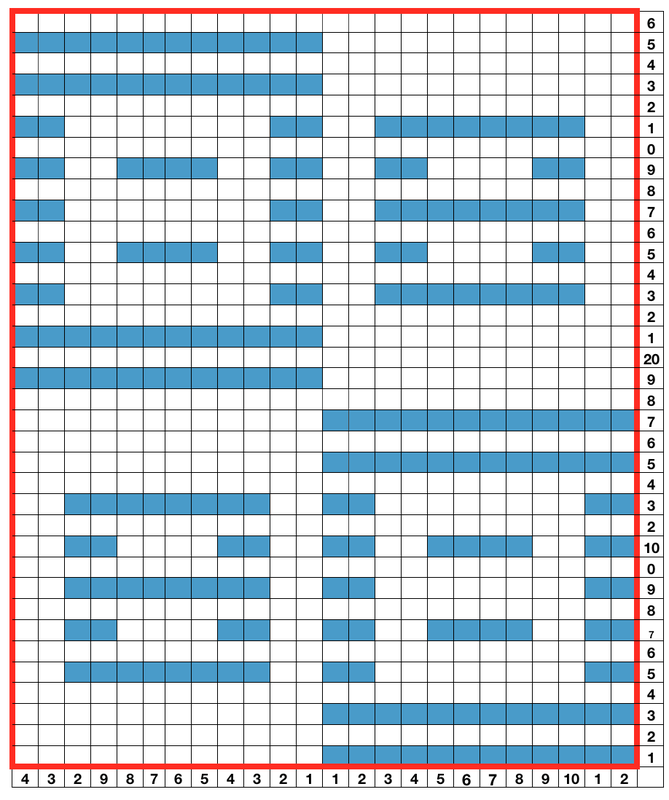 Simple block patterns such as these may be released upon completion of each “square” series, in this case, after 4 row segments. 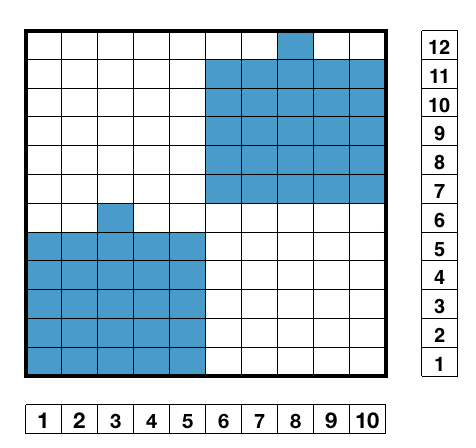 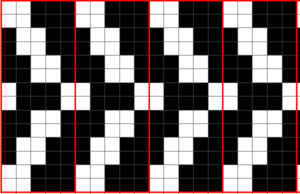 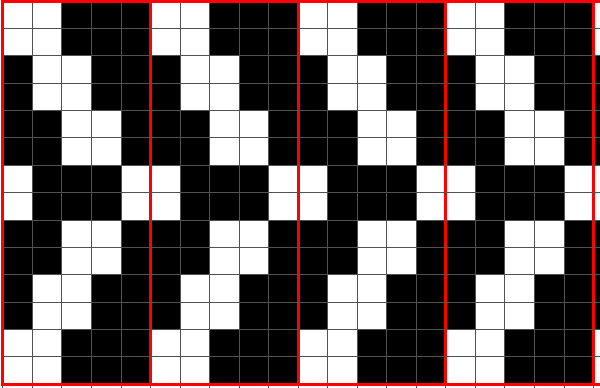 Rows 5 and 6, 11 and 12 are not part of the original repeat. 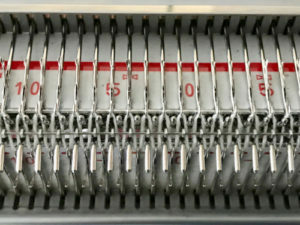 The 5th design row provides needle selection, traveling from right to left. 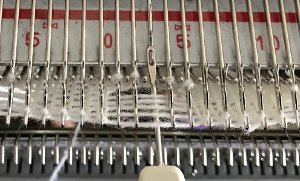 When the carriage passes in turn from left to right with no yarn, those preselected needles will drop while preselecting a blank design row (6) that allows the carriage to return to left hand side. 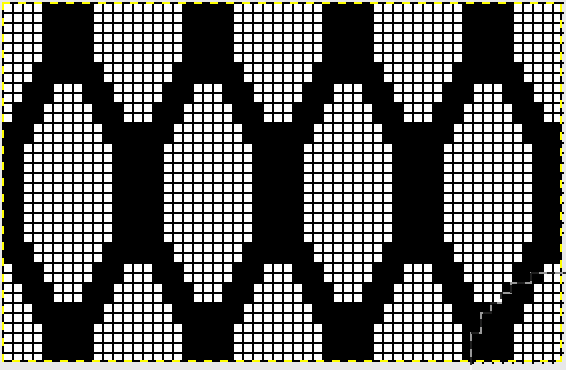 As it moves back to left, the carriage will preselect the first row of the design. 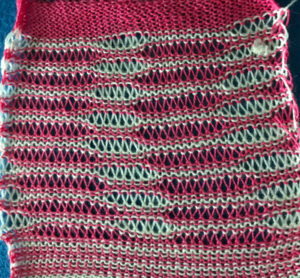 With COL yarn is picked up in order to knit the next set of dropped stitches. 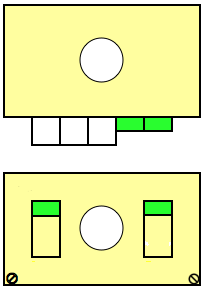 A color change may be made while the carriage is on the left. 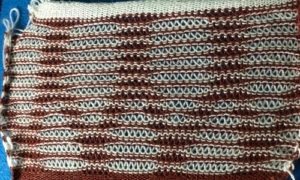 Begin with all stitches transferred and in work on the ribber only. 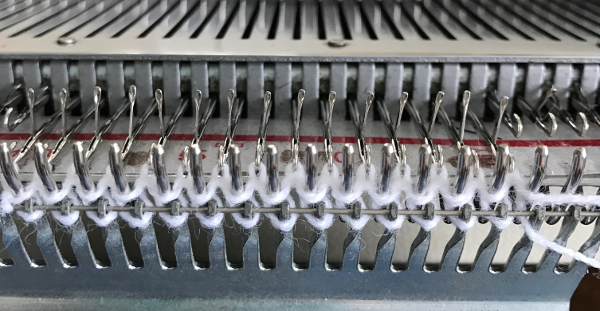 Every needle will be in work on both beds for the remaining fabric. 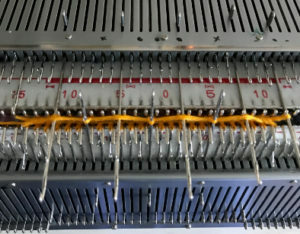 Ribber half pitch lever is on H. With COR set change knob to KC, preselecting from right to left for first row to be knit after pushing in in both part buttons. 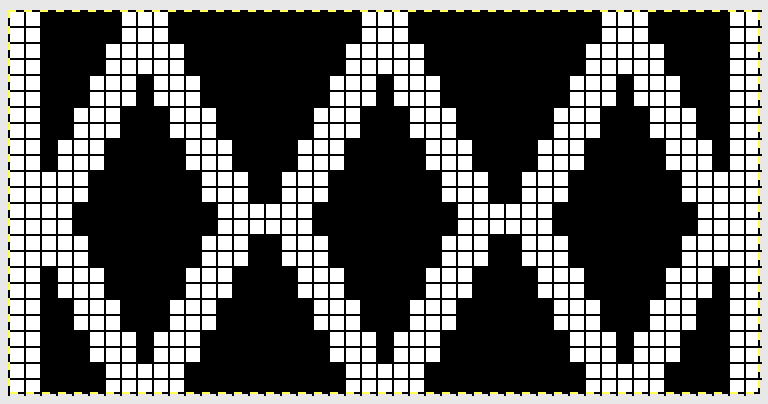 This allows the KC to travel to left without forming any loops or stitches, but preselecting first row of pattern. 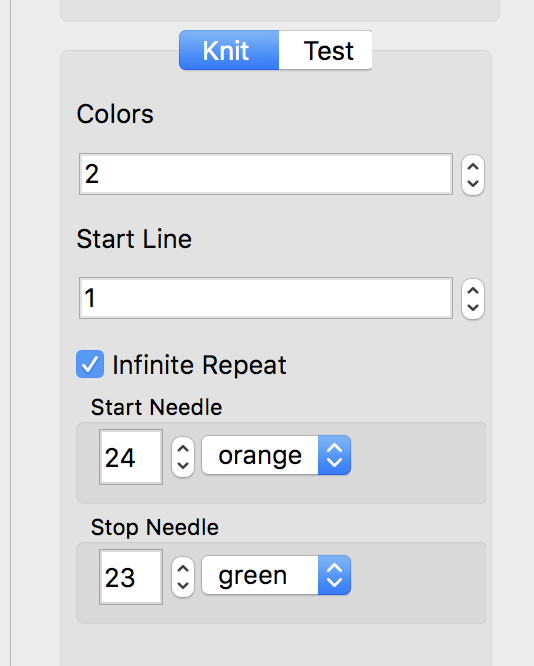 Change color if using more that one color, knit 4 rows. 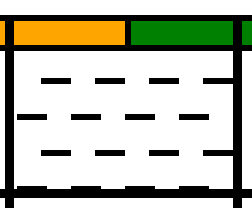 “color 3 (or 2) can be an empty feeder. 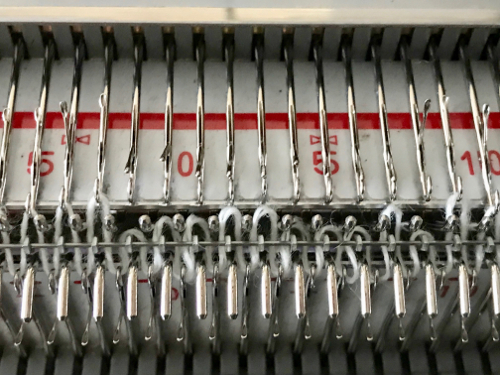 Change to color “empty” so yarn(s) in use are held until picked up again and there is no yarn in the ribber’s sinker plate yarn feeder. 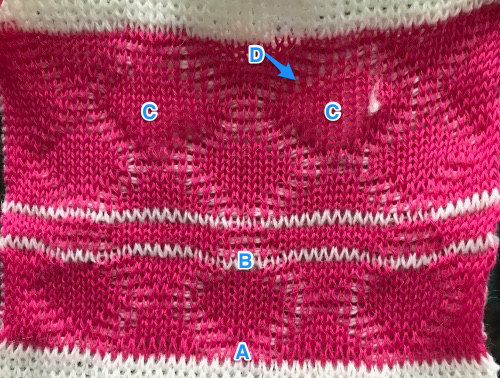 There are 2 options for dropping stitches. 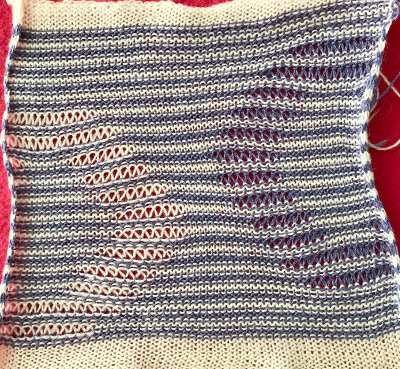 One is to disengage the KC from ribber, it will be picked up again as you move into the color changer to pick up yarn once more. 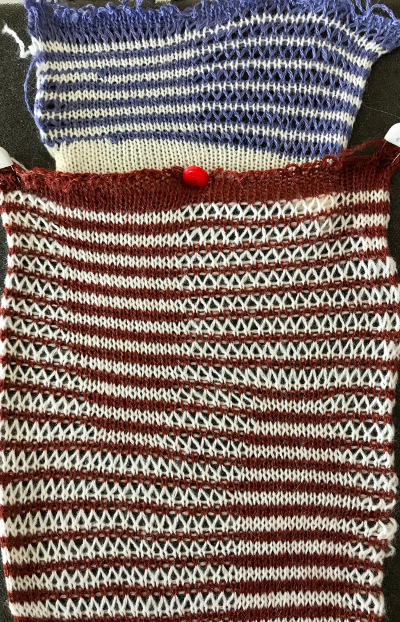 The other is to keep the carriages paired, set the ribber to slip for 2 rows, then back to knit as you return to the color changer, pick up yarn again, and continue to knit. 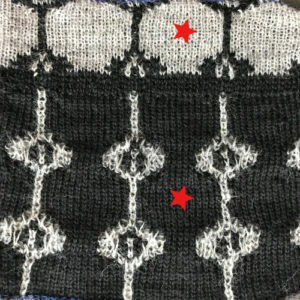 If row count is important ie in making a garment, the row counter gets turned off for the 2 rows when stitches are dropped, remember to turn it back on when knitting the next 4 pattern rows. I personally find this fussier and more error prone than other methods I have described. 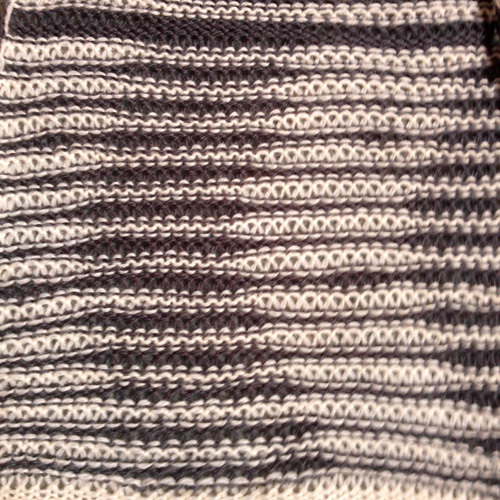 My swatch is knit in acrylic thin yarns, and lightly steamed, so bubbles have flattened out considerably. 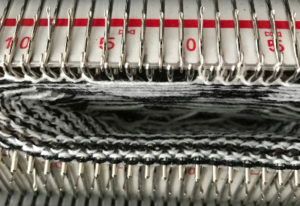 The fabric is a relative to that shown in the ribber techniques book page 23 , created by picking loops up on the ribber combined with racking. 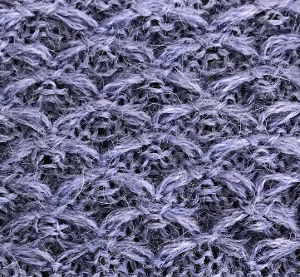 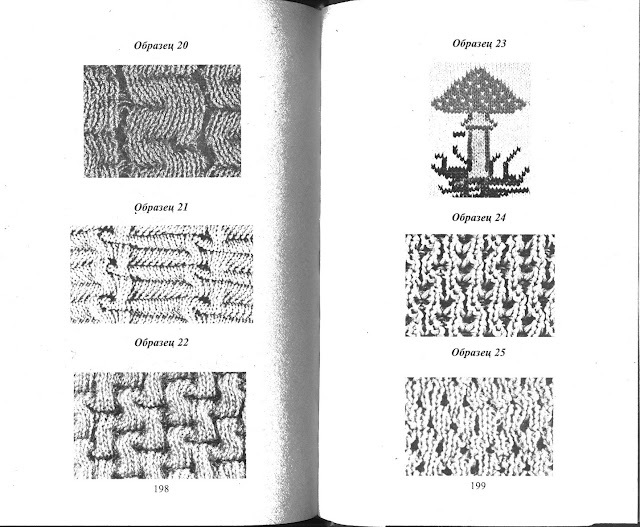 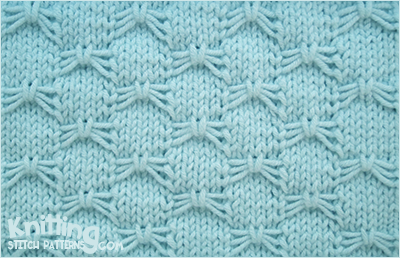 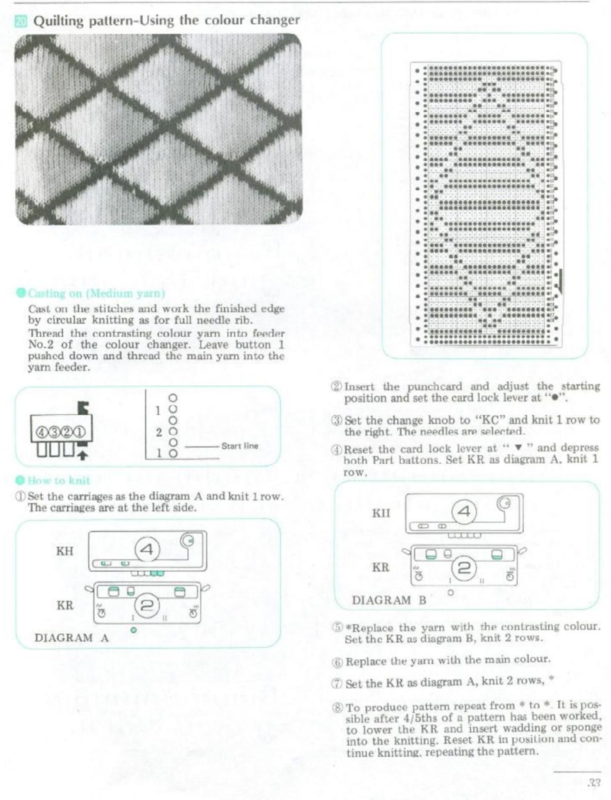 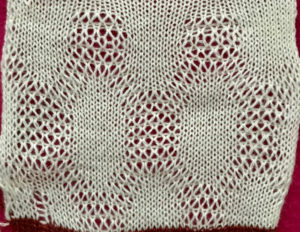 Lace patterns may be used for drop stitch following a similar “no yarn” method. 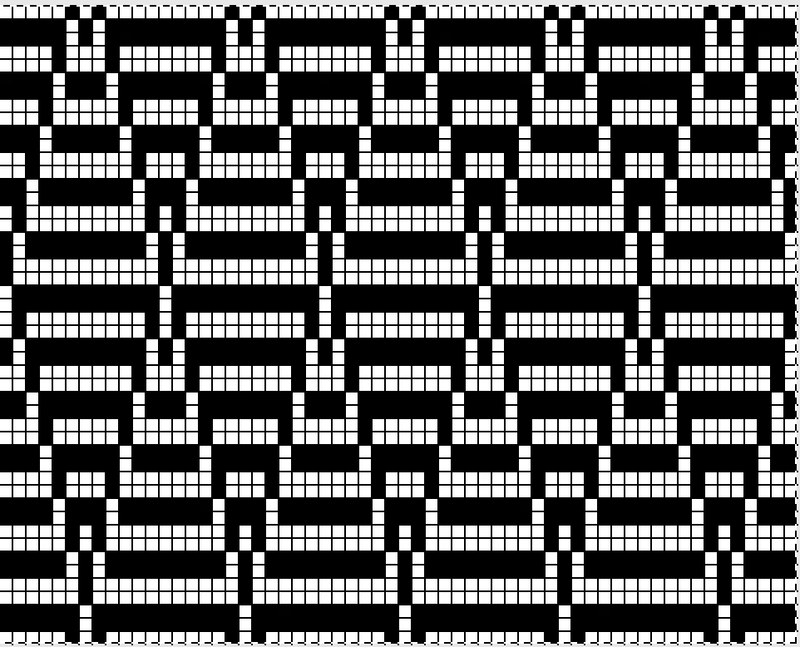 Program the pattern in the usual manner. 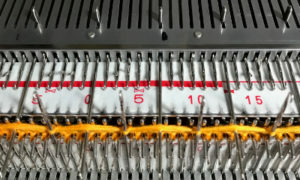 Set change knob to KC II cancelling end needle selection, the knit carriage to slip <– –> and continue knitting until all needles are in B position. 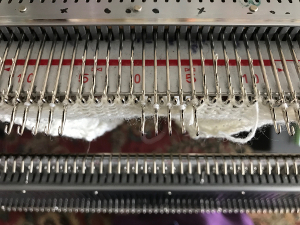 At that point disconnect main bed and ribber carriages, unthread the yarn or have it held for you in yarn changer. 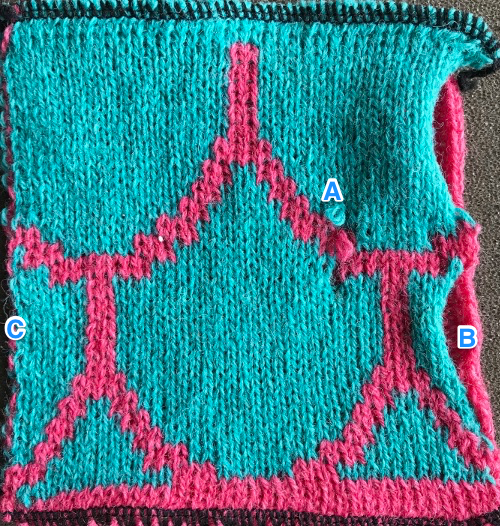 Set the main carriage to knit, move across needles in B, dropping them since no yarn is in use. 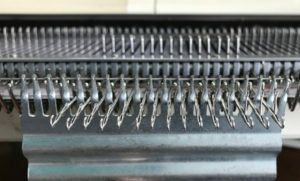 Bring the disconnected carriage across the knitting again, reconnect to the ribber carriage and rethread. 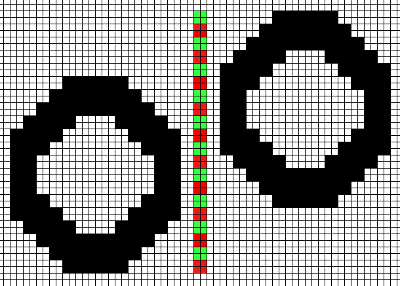 Set KC to slip again, repeating the process. 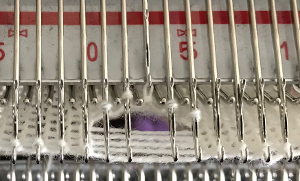 As an alternative for dropping stitches, leave KC set to slip, push all needles out to hold. 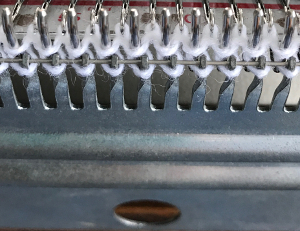 With no yarn in feeder any loops will be dropped. 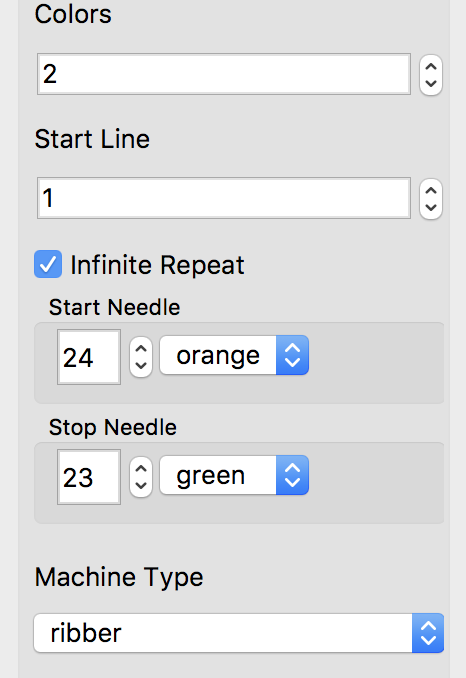 Make the the 2 passes with KC only as described, reconnect carriages, rethread, and continue until no needles are selected again. 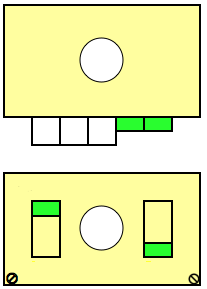 Tuck cards may also be used. Plain knit rows between series of tucked rows make for an easy to identify spot for dropping stitches. 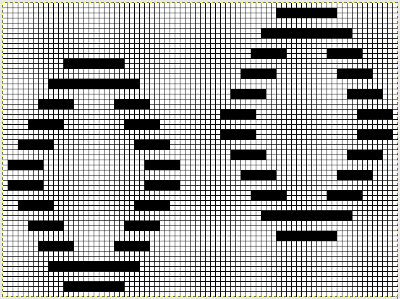 Since in such cards you are working with punched holes or black squares, the empty knit only carriage may be taken across with no yarn, dropping the complete, all knit row. 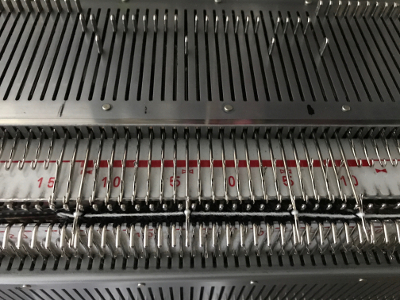 It is not necessary to change the knit carriage setting from tuck to slip to do so. 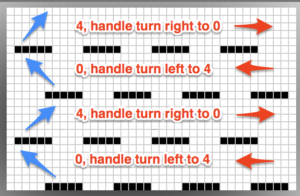 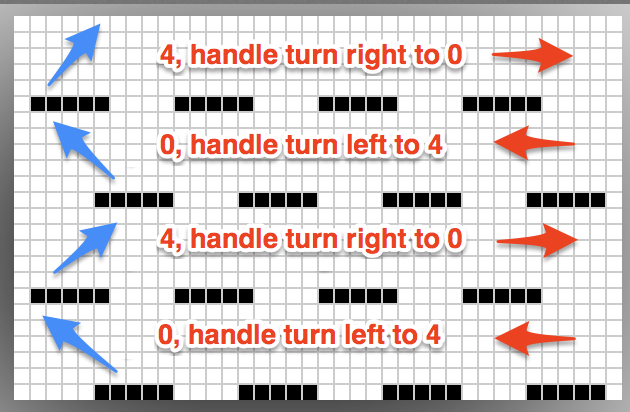 Tuck is an alternative option for a free pass as well, and realizing that helps avoid errors in patterning by missing resetting the cam buttons between the two functions. 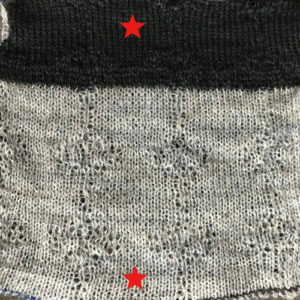 A recent forum discussion on DBJ on Ravelry led to my looking back on some of my previous posts. 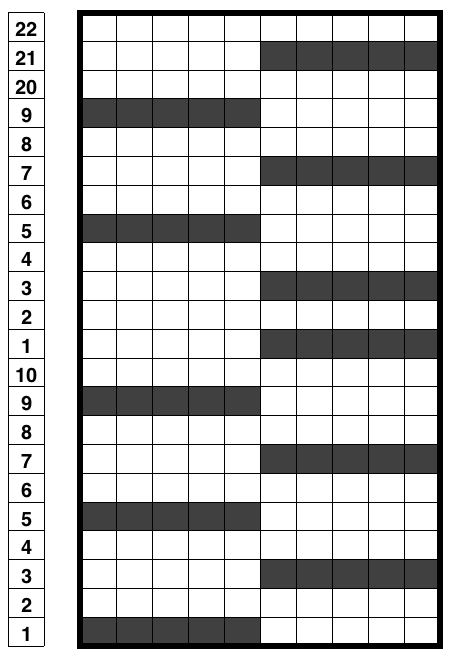 Some of the features in both excel and numbers changed over the years, but most basics remain. 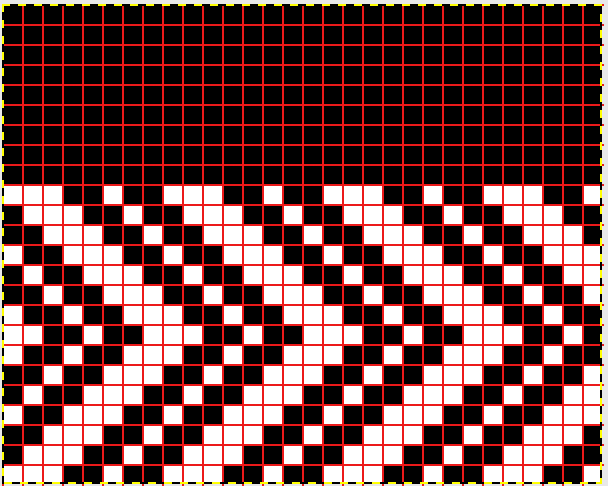 Program specific or a “software” general search in previous posts touch on GIMP, other programs and other fabric design choices. 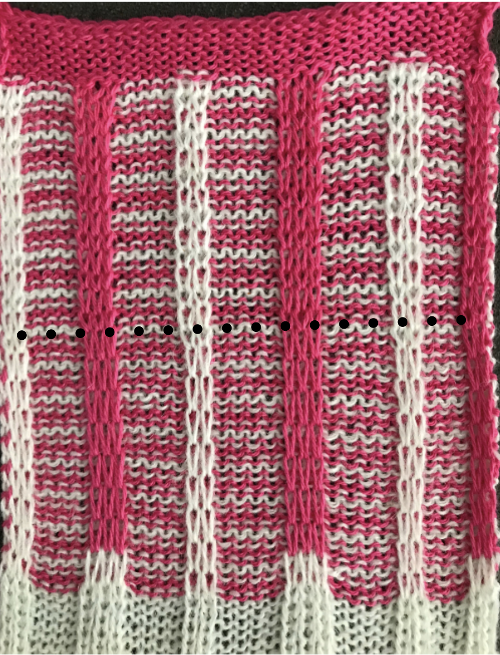 Most color changers only accommodate 4 colors, so in creating separations for double jacquard, this tends to be the maximum number. The more colors one uses in a row of knitting , the more all the stitches on the face of the fabric must stretch in order to accommodate the colors laid behind in the backing fabric. 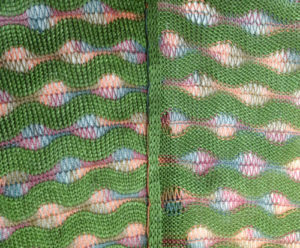 The more the stitches on the front face of the fabric must stretch, the muddier the look of the design, and the more “bleed” or “grin” through of the backing colors through the stretched stitches. A color separation is required. 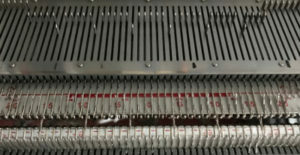 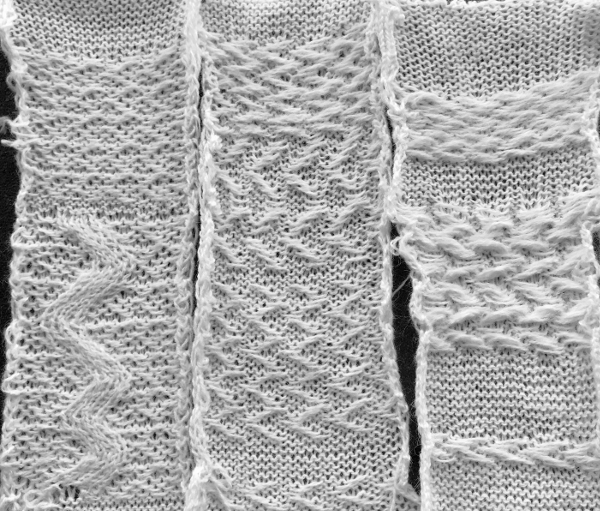 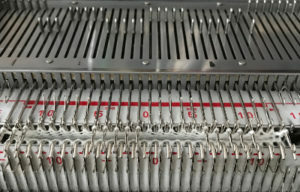 The best method for the separation depends on the knitting technique to be used , the knitting machine one owns and its capabilities, the desired look of the finished fabric, and the method for creating the separation. 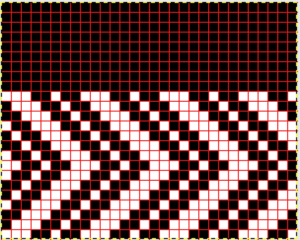 In Method 2 (graph 2): the first preselection row is performed moving away from the color changer, so that the ground color is knit first for one row, moving toward it. 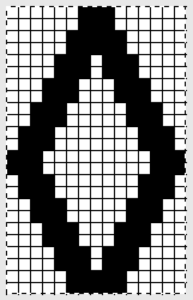 This should fill in the majority of the needles. 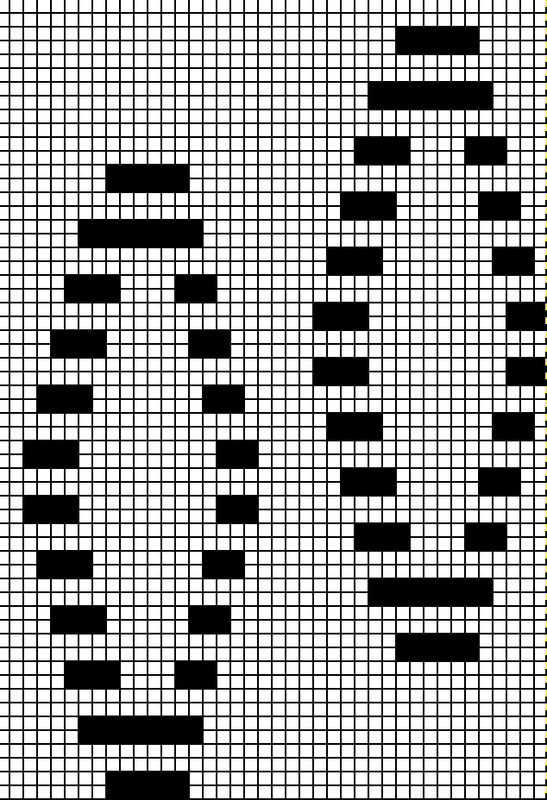 When the last row is reached, the color is changed back to the ground color, Row 2, the carriage will be on the right, heading back to the color changer as the sequence is completed. 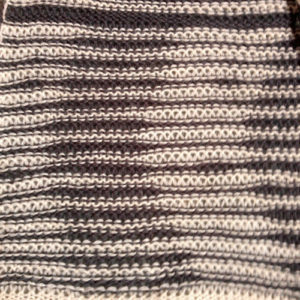 The expectation is that the ground color, 1, will knit the majority of the needles. 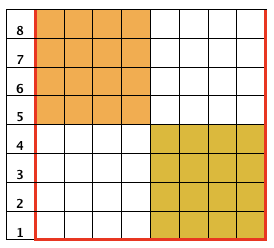 Method 3 (graph 3): is similar to Method 2, but the ground and background are not split in the first 2 rows of the graph. 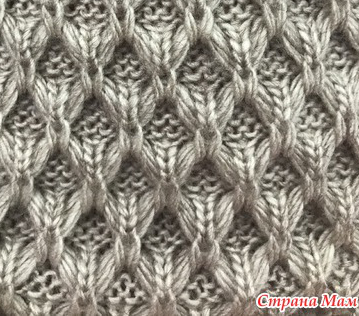 This is the hardest to achieve in terms of knitting without errors in patterning or dropped stitches. 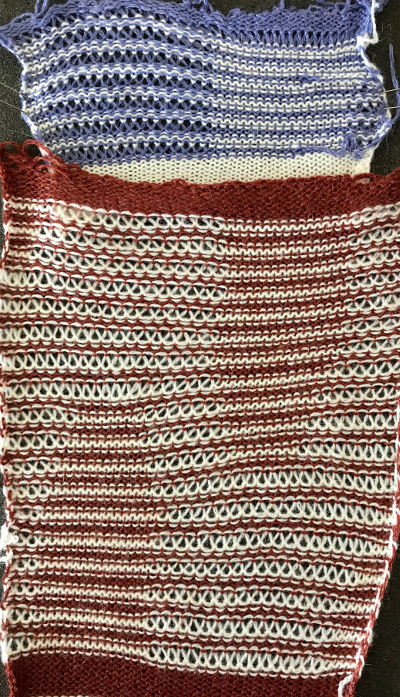 The main color knits for 2 rows before the other colors knit, may alter availability of needles required empty for placement of the stitches in next color row. 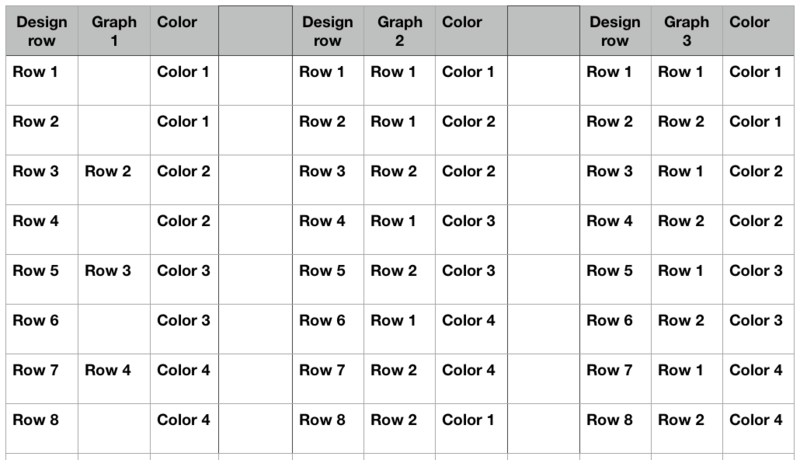 In both methods 2 and 3 the design must have an even number of rows.